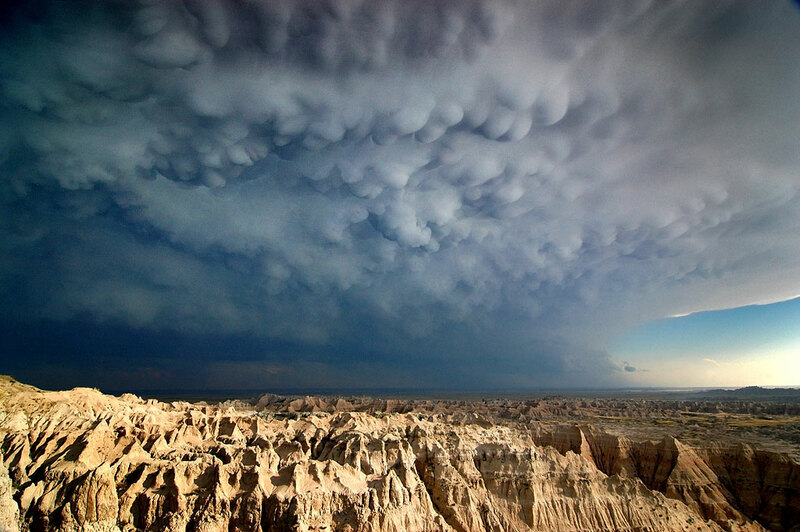 A thunderstorm creates dramatic mammatus clouds over Badlands National Park, South Dakota. 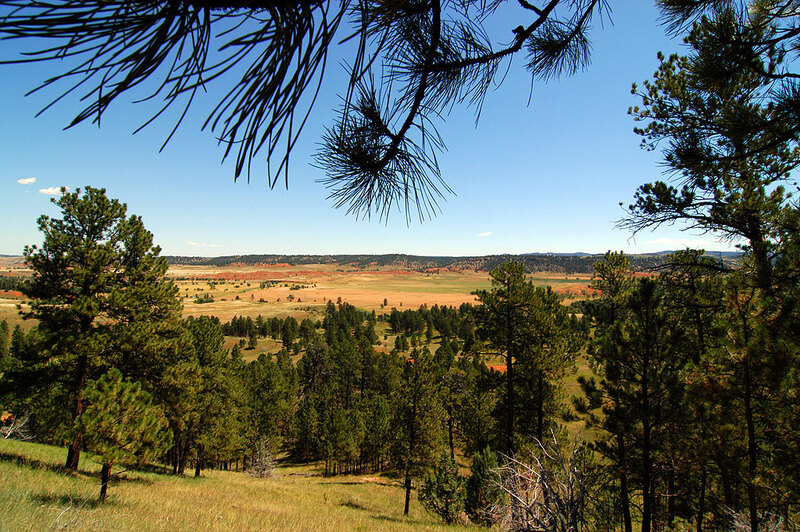 Many years ago, Abby and her family traveled to the open rangeland of Wyoming to hunt and camp. 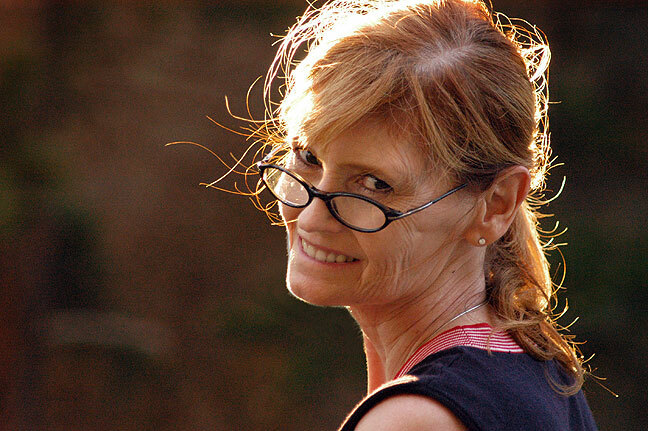 She wanted to return and see the sites as an adult, so we decided this would be a good time to go. 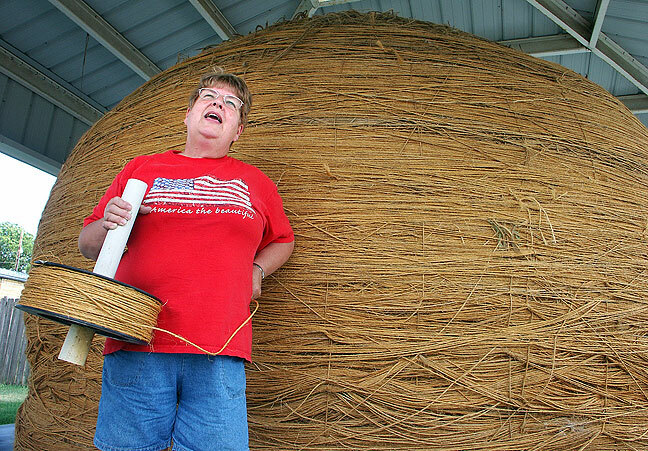 This nice lady in Cawker City, Kansas, told us all about the world’s largest ball of sisal twine. 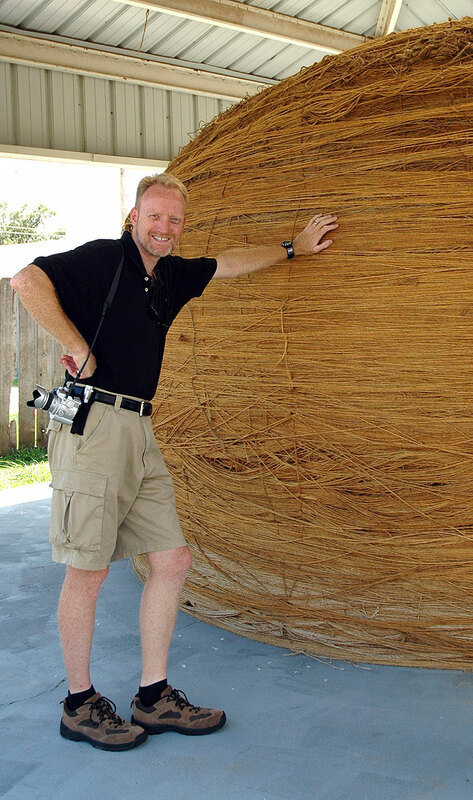 Downtown Kawker City, Kansas has an interconnected series of artworks with the Twine Ball in them. 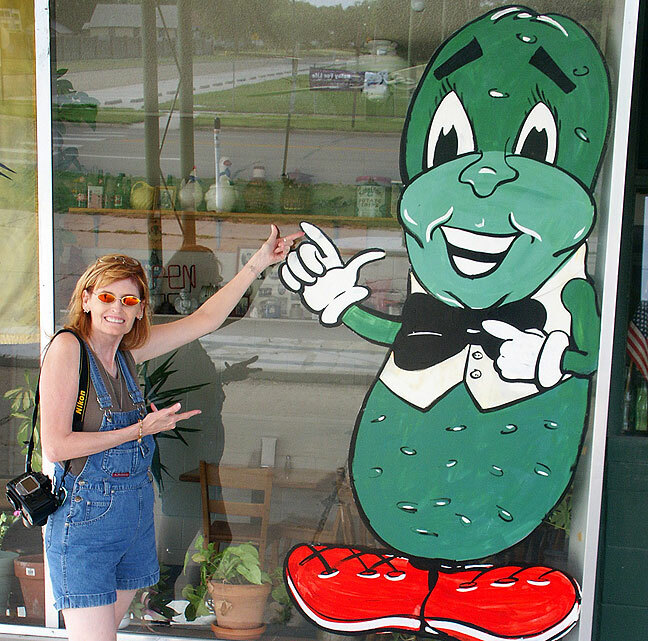 Abby poses at The Chubby Pickle on a roadside in Kansas. 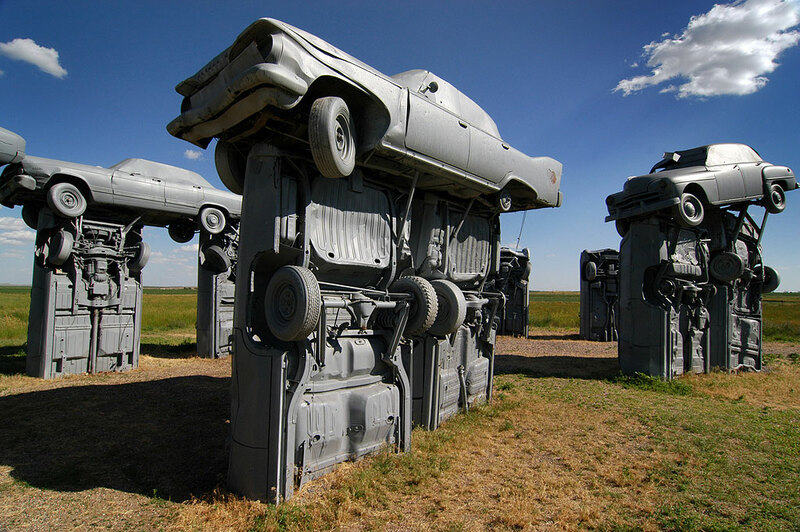 We also stopped at a place called The Chubby Pickle by the side of the road in Phillipsburg, Kansas. 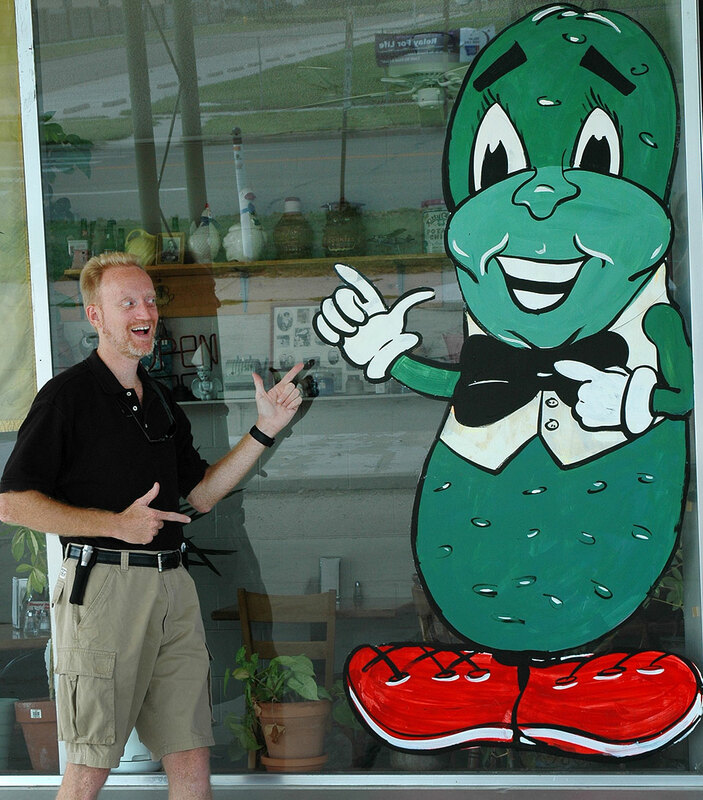 Your host poses with The Chubby Pickle in Phillipsburg, Kansas. 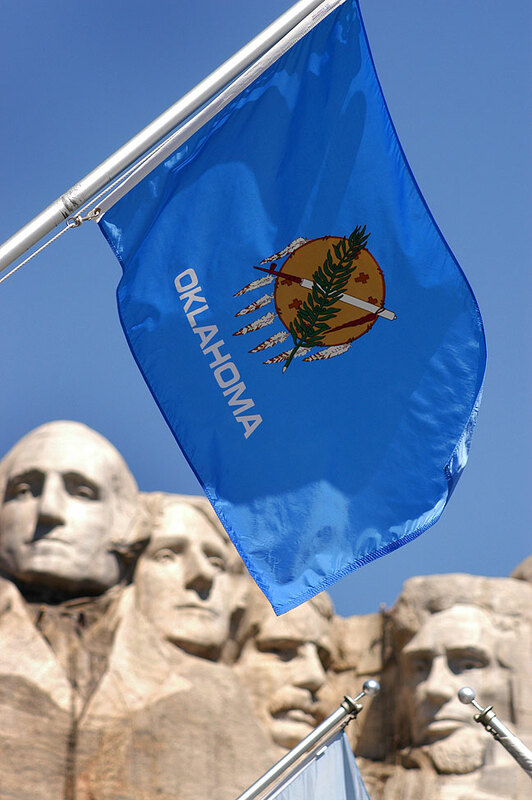 We stopped briefly in Ogallala, Nebraska to photograph the old west display. 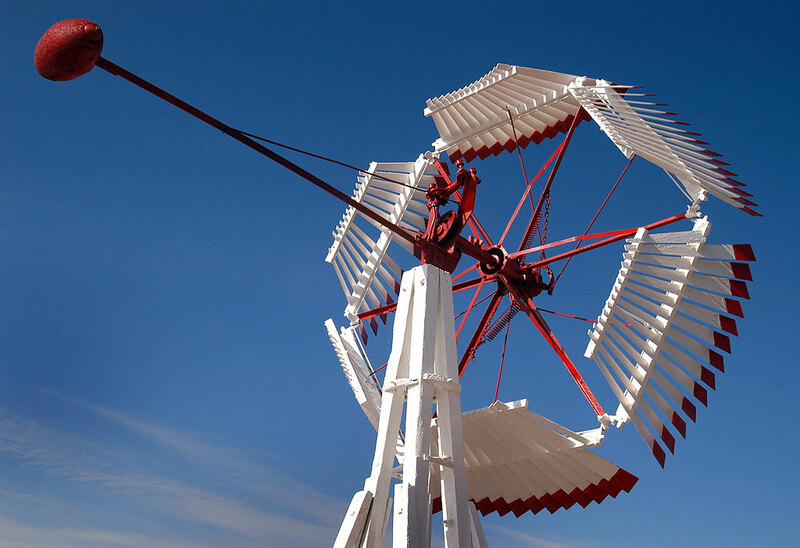 This brightly painted windmill was part of Ogallala’s old west display. 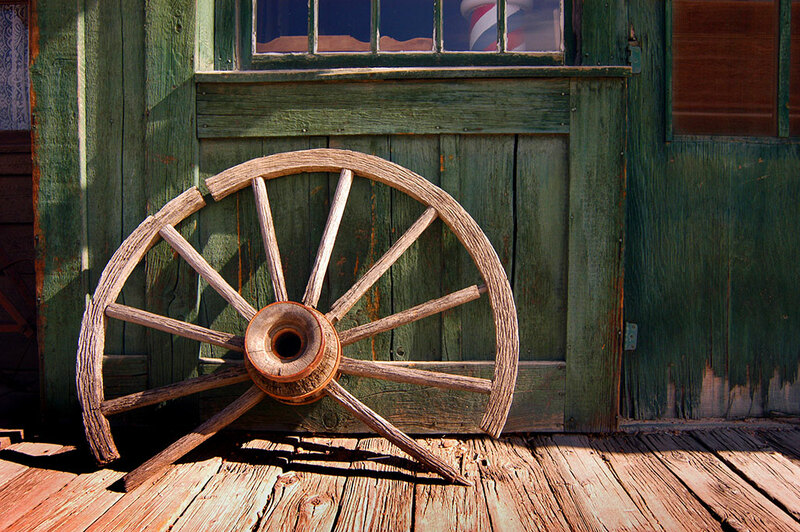 A broken wagon wheel sits on the wooden boardwalk of Ogallala, Nebraska’s old west display. We stopped by Courthouse Rock and Jailhouse Rock in Nebraska, which was interesting, but which didn’t make very many pictures. 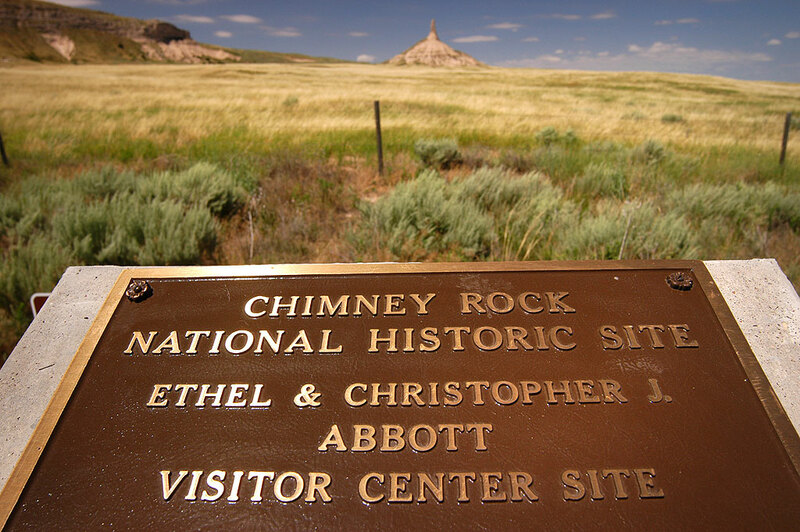 We also stopped at Chimney Rock, which was interesting from a historical perspective. 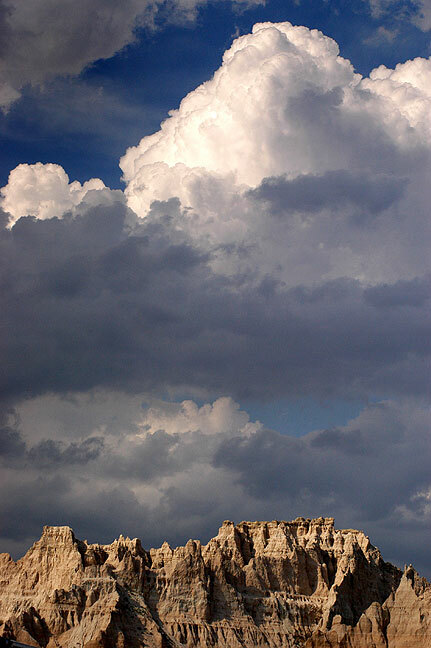 Scotts Bluff National Monument was the first feature of the day that made any significant pictures. 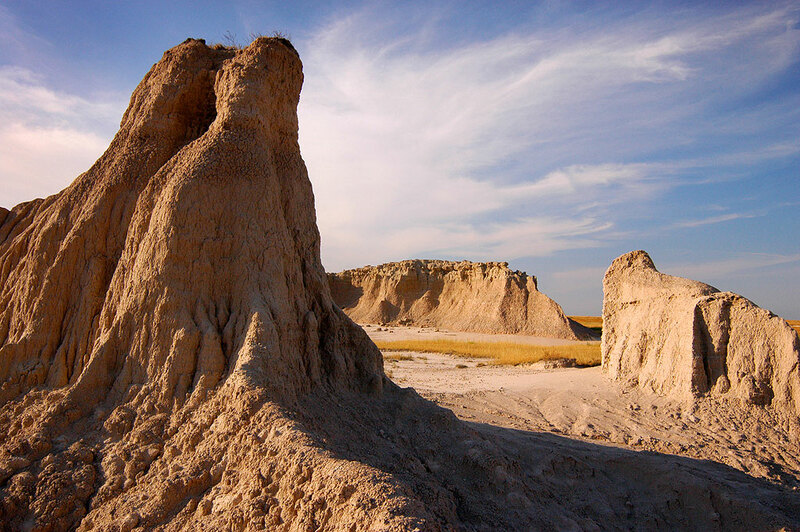 We drove and hiked at Scotts Bluff, which is a 19th-century landmark on the Oregon Trail and Mormon Trail. 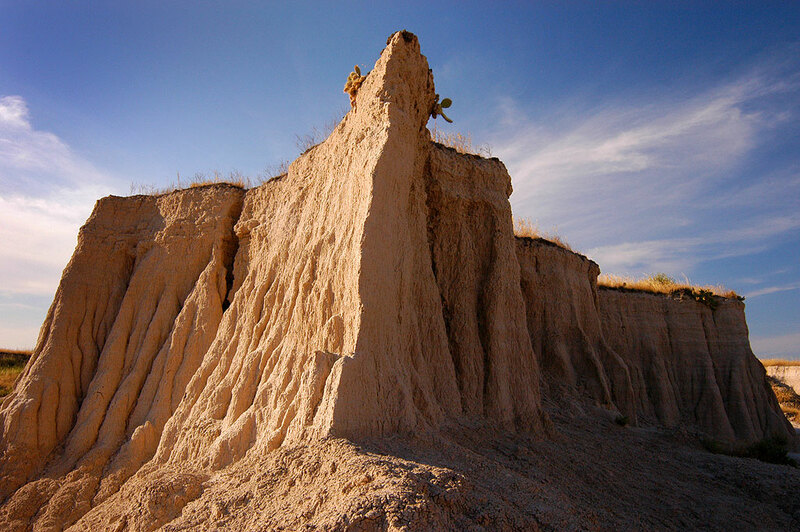 Abby makes pictures at Scott’s Bluff National Monument, Nebraska. 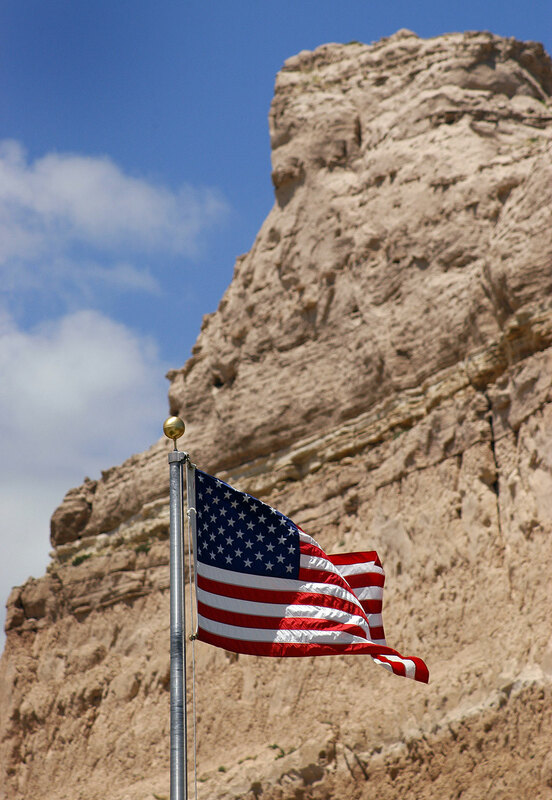 A U.S. Flags waves in the breeze at Scott’s Bluff National Monument. 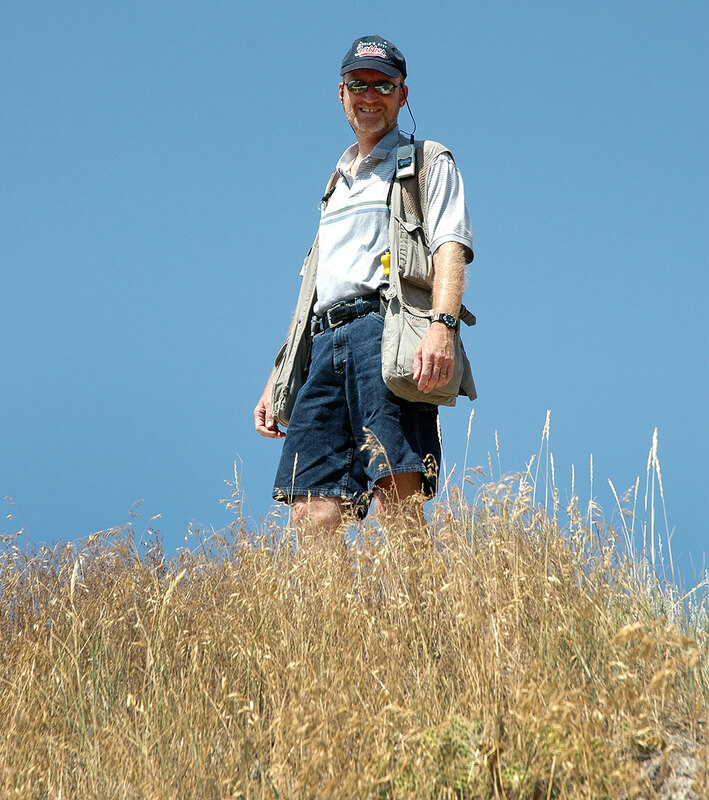 Abby photographed me on an overlook at Scott’s Bluff. 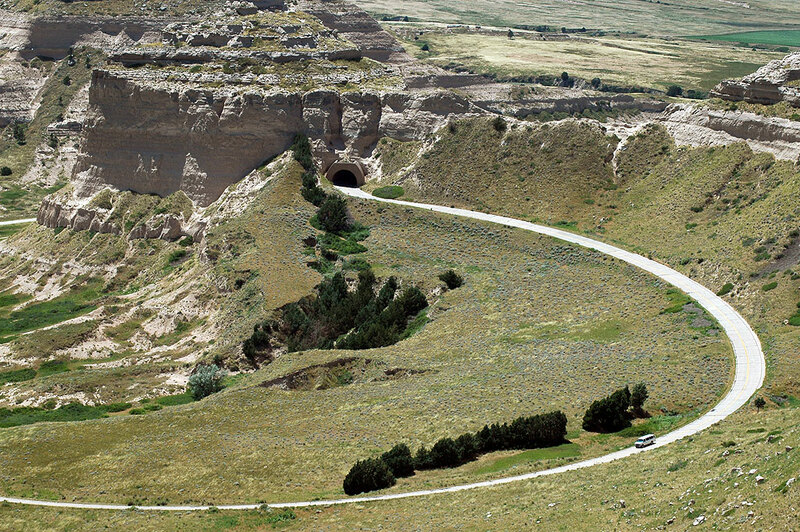 Abby made this image of the curved road leading to the top of Scott’s Bluff. 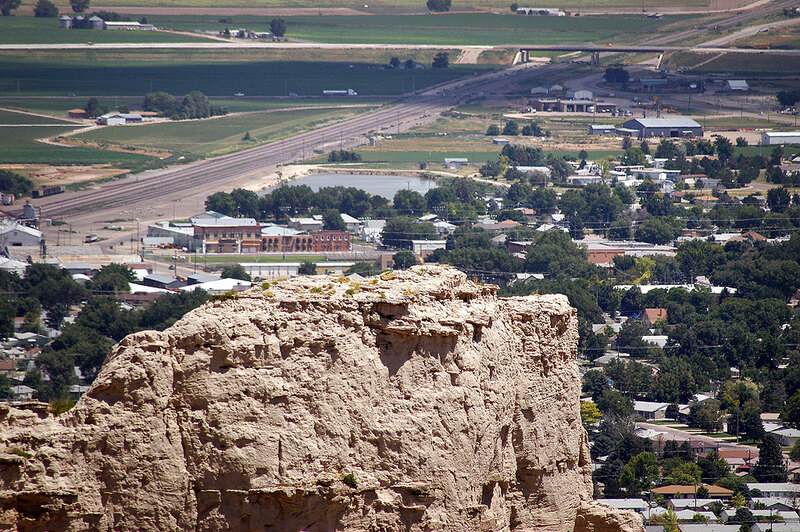 The city of Scottsbluff is visible from Scott’s Bluff National Monument. 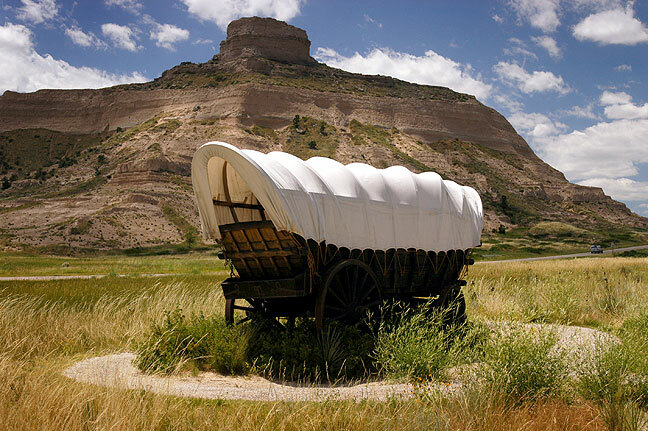 A covered wagon is commemorated at Scotts Bluff National Monument. 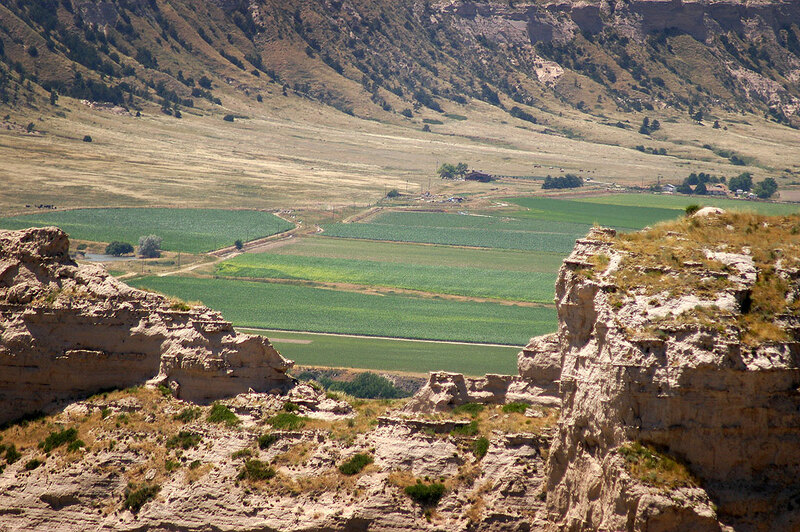 This view looks west from Scott’s Bluff National Monument. 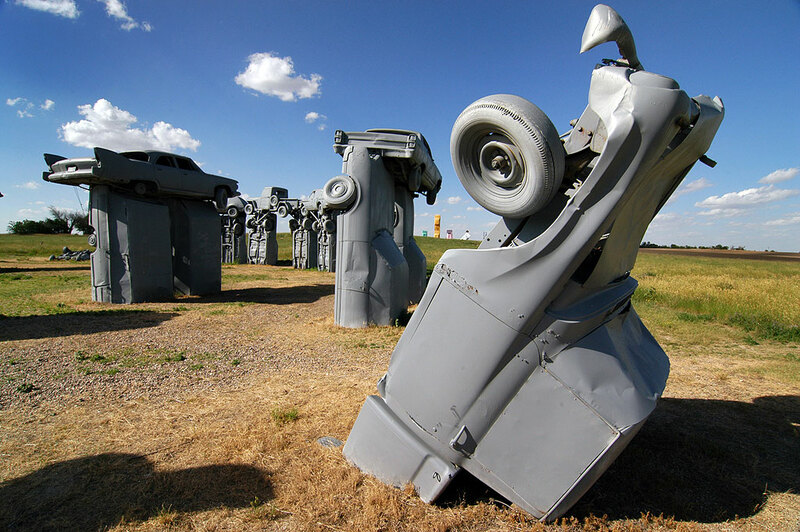 Carhenge was one of our most interesting stops. 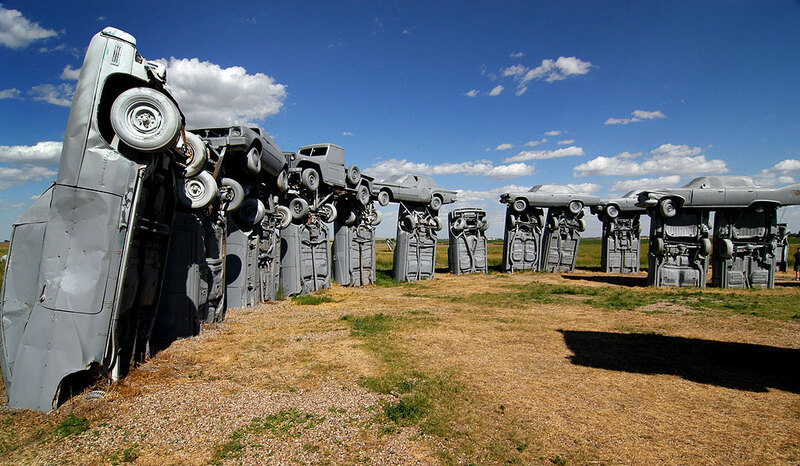 Exactly like it sounds, it is a replica of Stonehenge, made of grey painted cars. 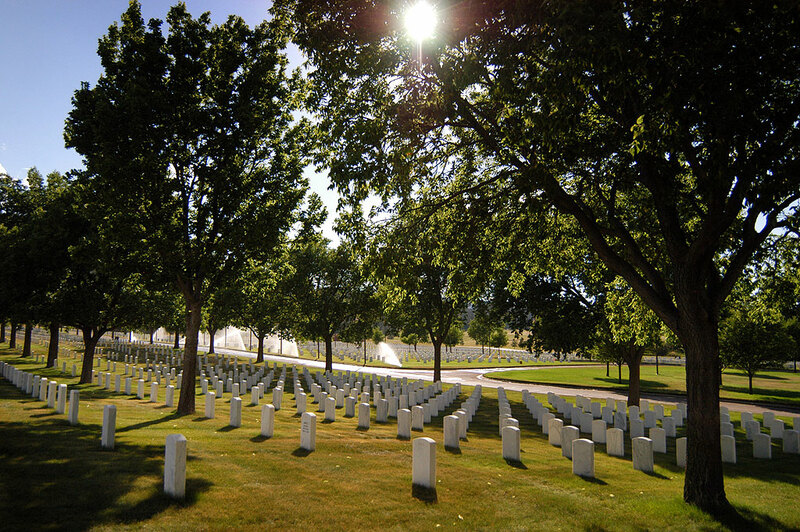 It was a beautiful day, and the light and sky were perfect for it. 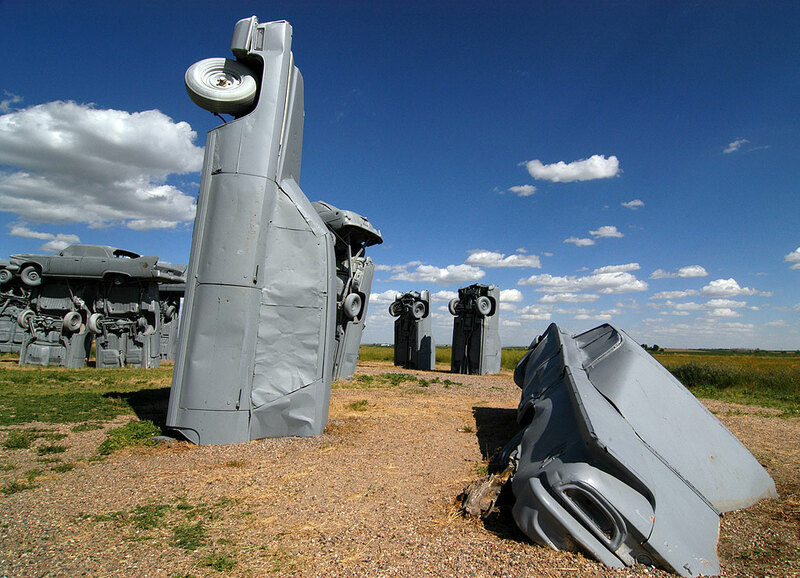 Our second day on the road included the elaborate and fascinating Carhenge near Alliance, Nebraska. 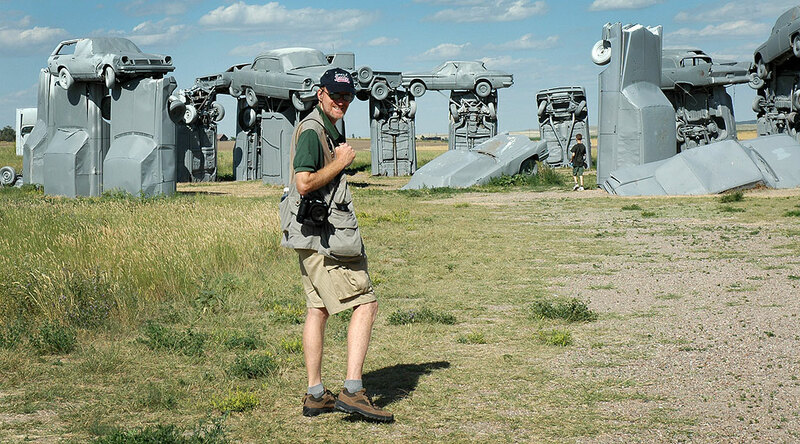 The author approaches the vehicles at Carhenge, a replica of Stonehenge made entirely of cars. 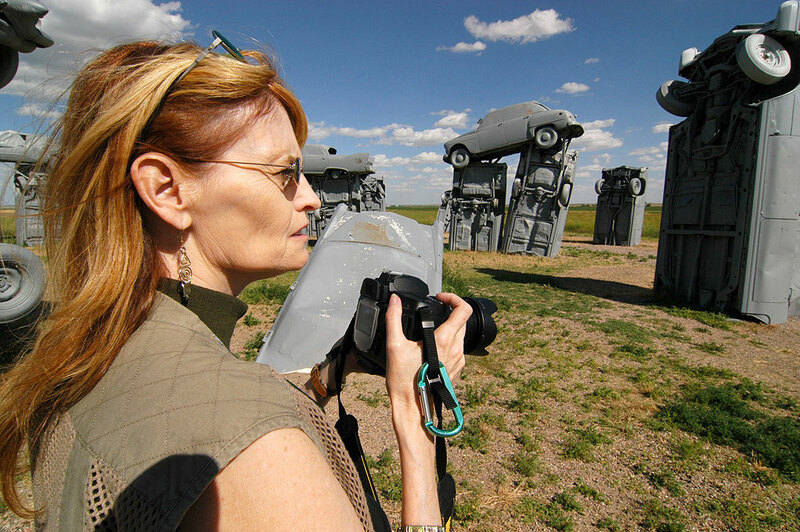 Abby photographs Carhenge in Alliance, Nebraska. 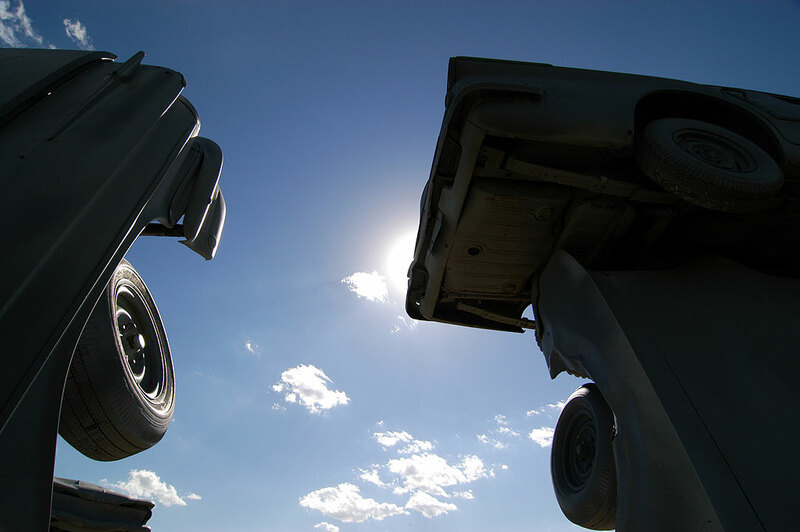 The cars of Carhenge are silhouetted against a beautiful summer sky. 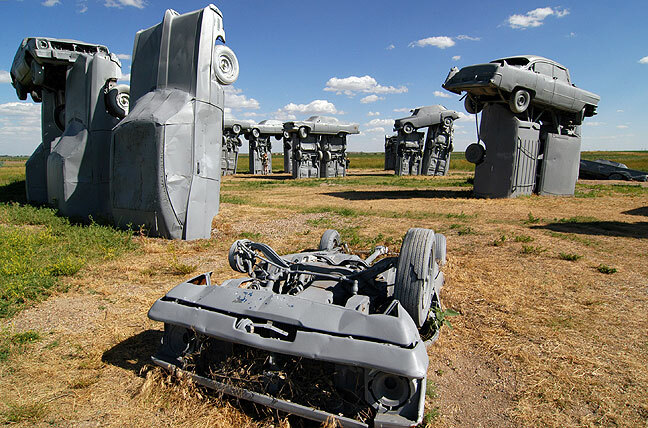 Painting the cars grey at Carhenge makes for a very different look that the colorful graffiti of an attraction like the Cadillac Ranch. 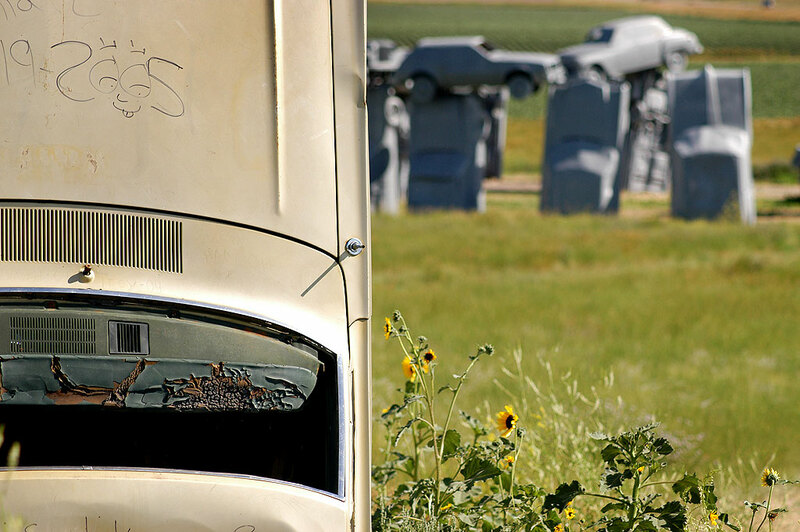 A graffiti tag on a car in the Car Art Reserve at Carhenge marks the year 2005. 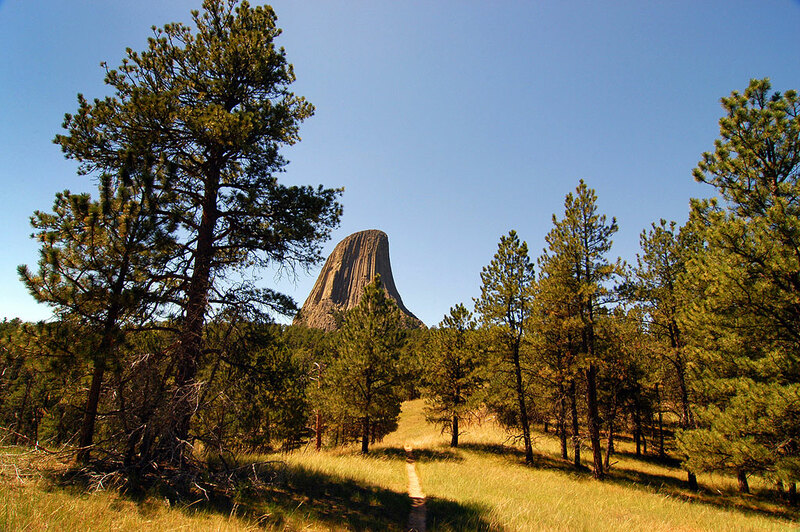 Abby hikes the Red Beds Trail around Devil’s Tower. It was a nice day, but hot. 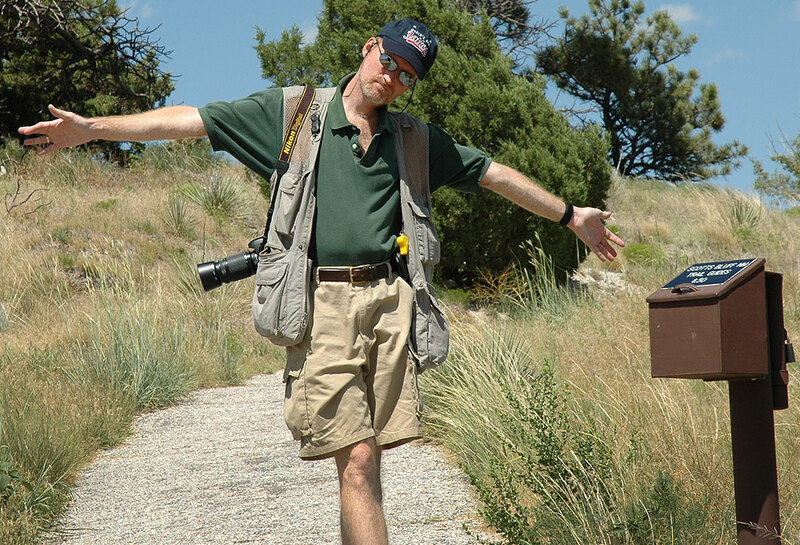 We drove to Devil’s Tower National Monument, where the Marklars were out in force. 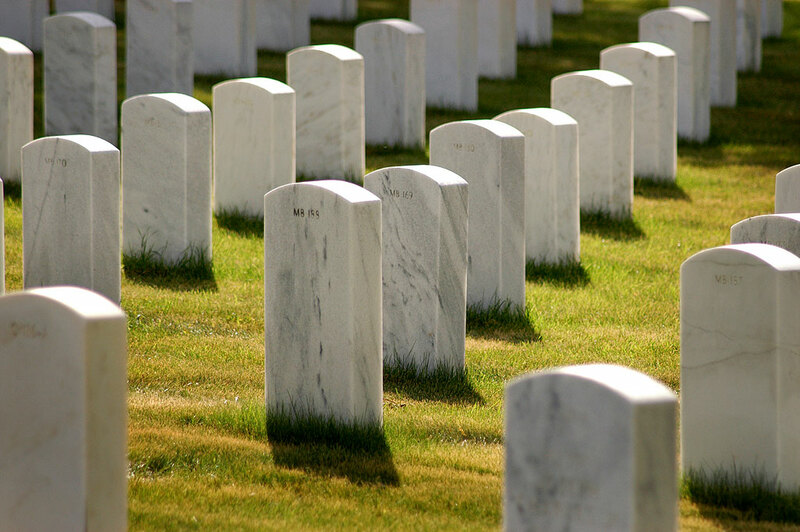 We left them behind by simply taking the first real trail around the tower, the Red Beds Trail. 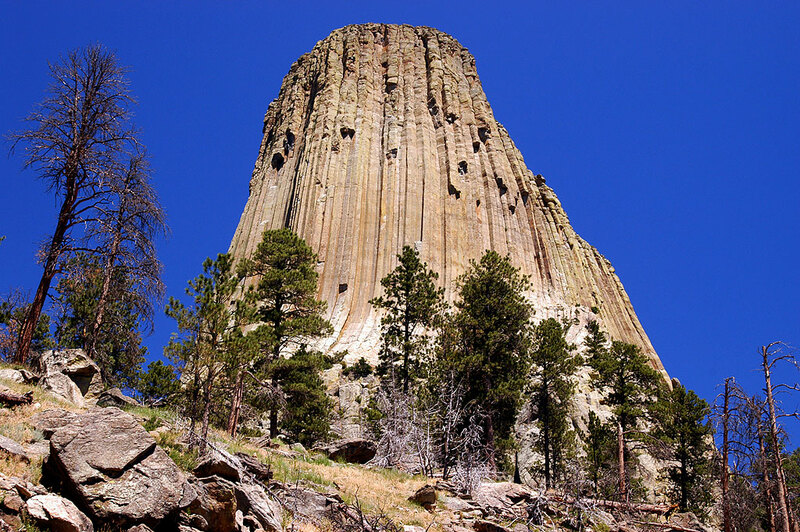 It was a 2.8-mile trail that took us the long way around the Tower. 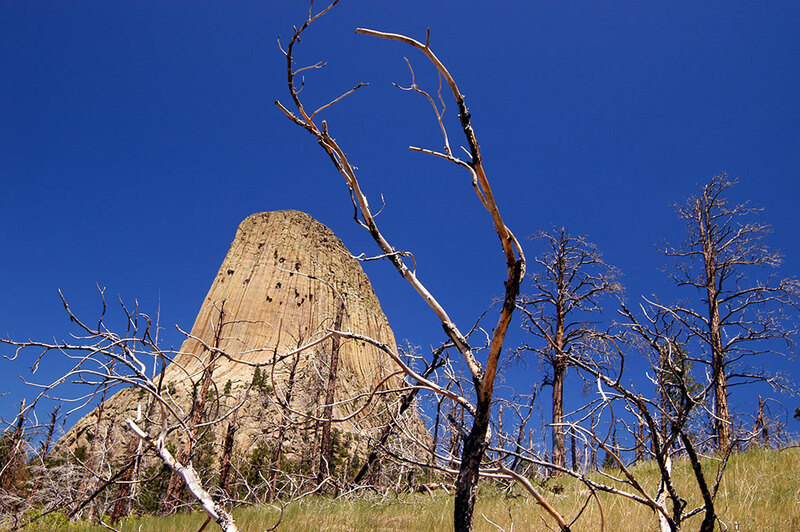 The Red Beds trail at Devil’s Tower is so named because it passes these red fossil beds. 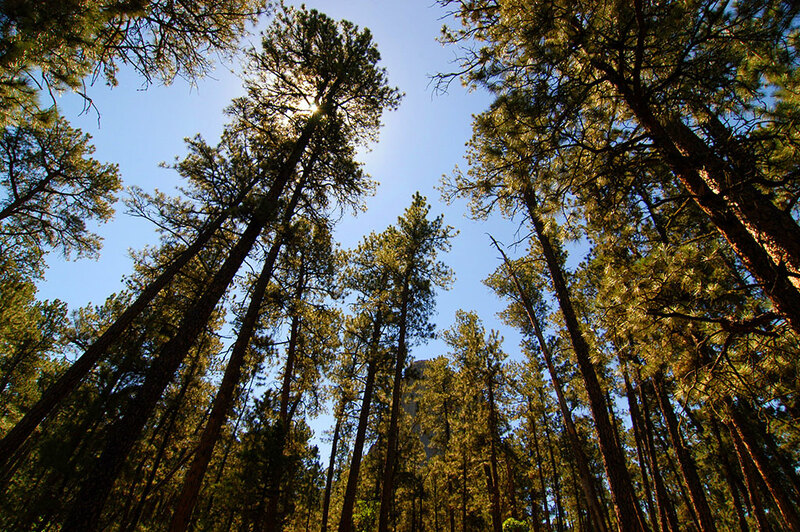 The Red Beds trail takes hikers into this tall forest. 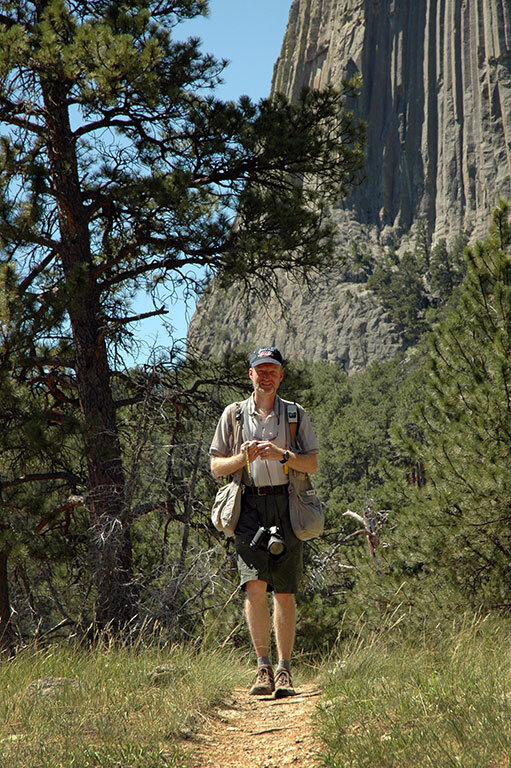 The author hikes the Red Beds trail at Devil’s Tower. 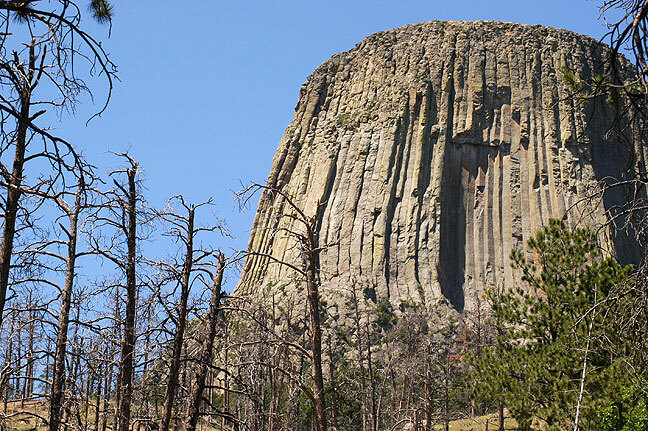 This is the view on the eastern end of the Red Beds trail at Devil’s Tower. 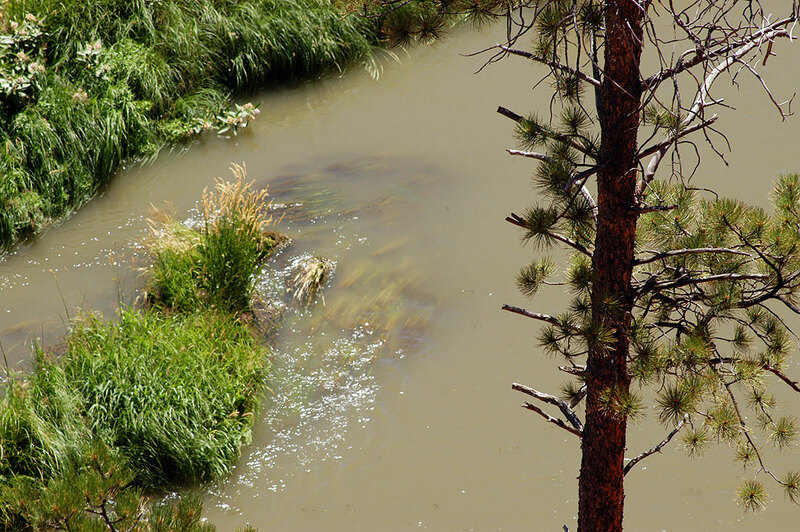 The Red Beds trail also takes hikers to a point above the Belle Fourche River. 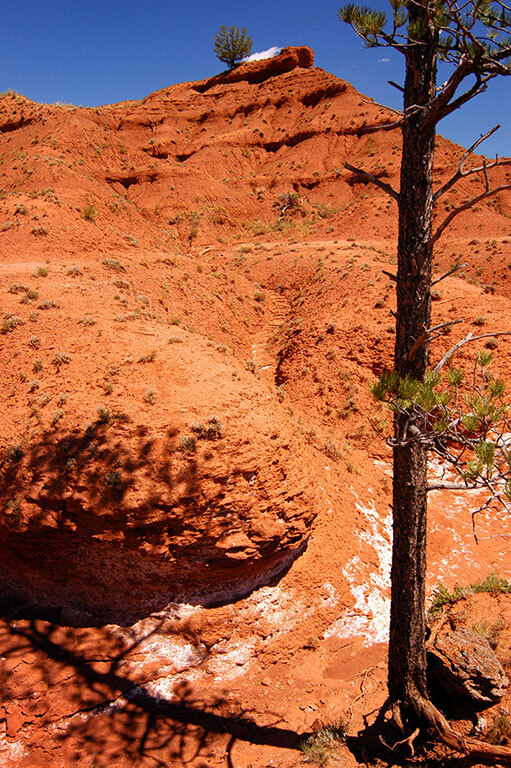 The Red Beds trail passes a span of burned forest. 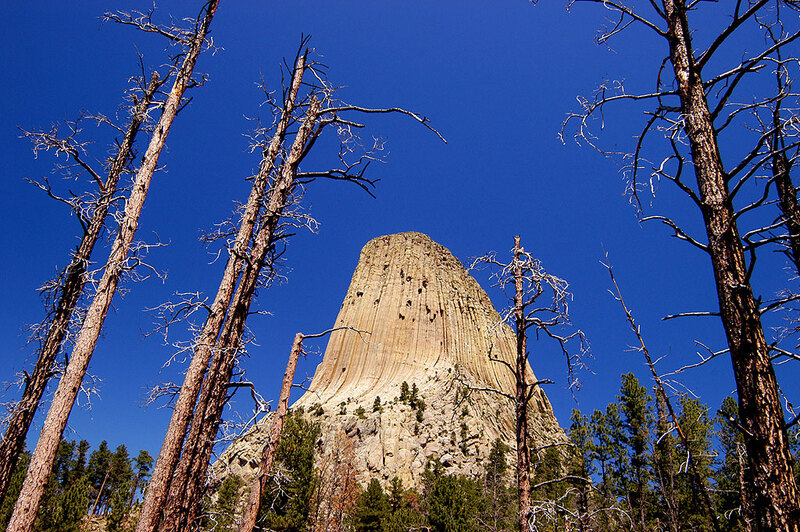 The Devil’s Tower is set against a deep blue summer sky. 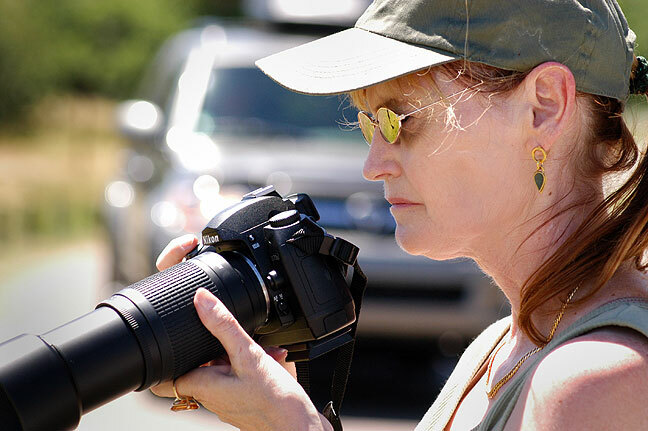 Abby makes pictures of prairie dogs near Devil’s Tower. Abby poses with a giant prairie dog near Devil’s Tower. 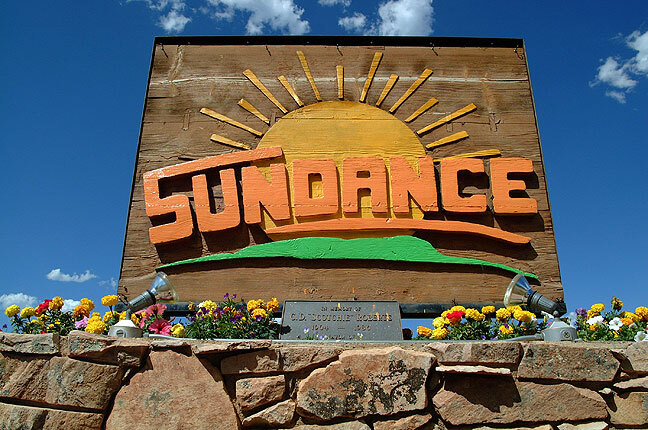 Next was Sundance, Wyoming, and after visiting we named this trip “Sundance.” We saw and photographed a bronze statue of The Sundance Kid. 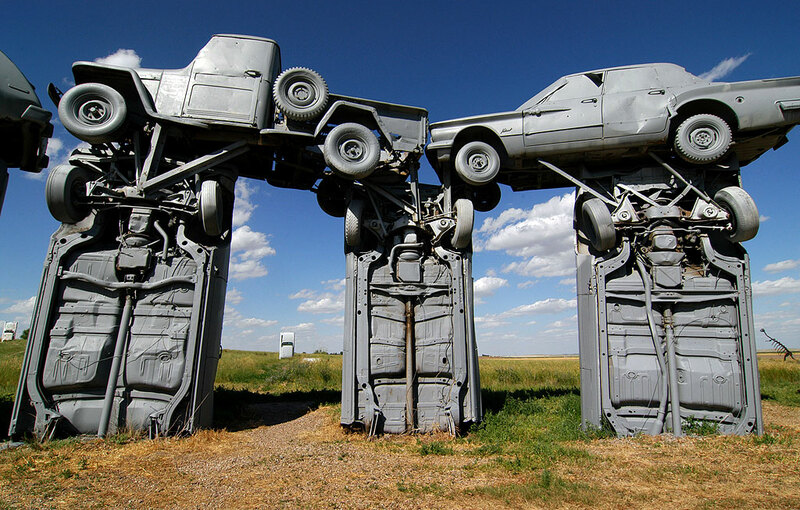 This welcome sign greets visitors to Sundance, Wyoming. 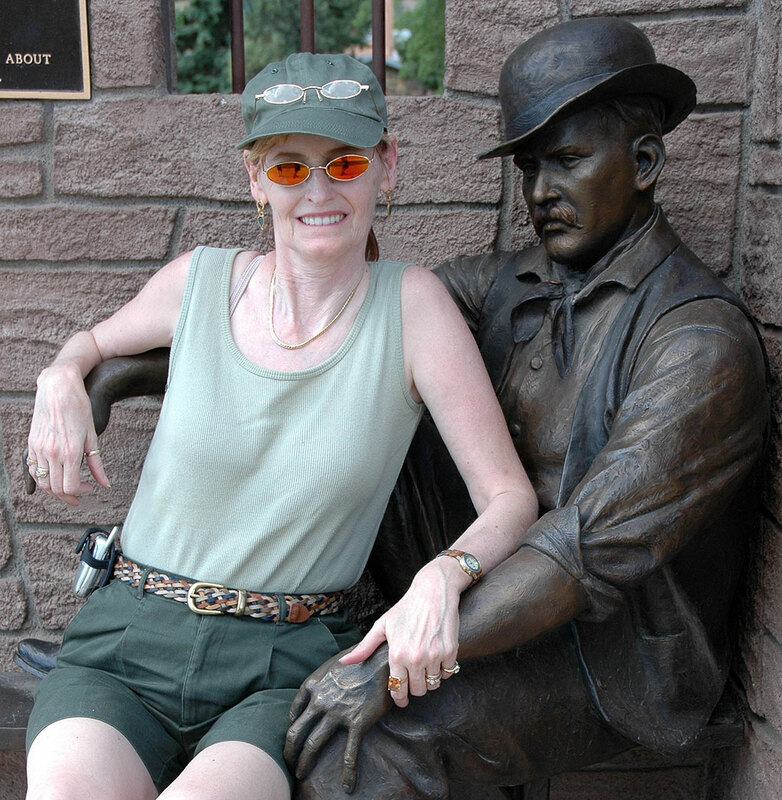 Abby smiles as she poses with the bronze statue of The Sundance Kid in Sundance, Wyoming. 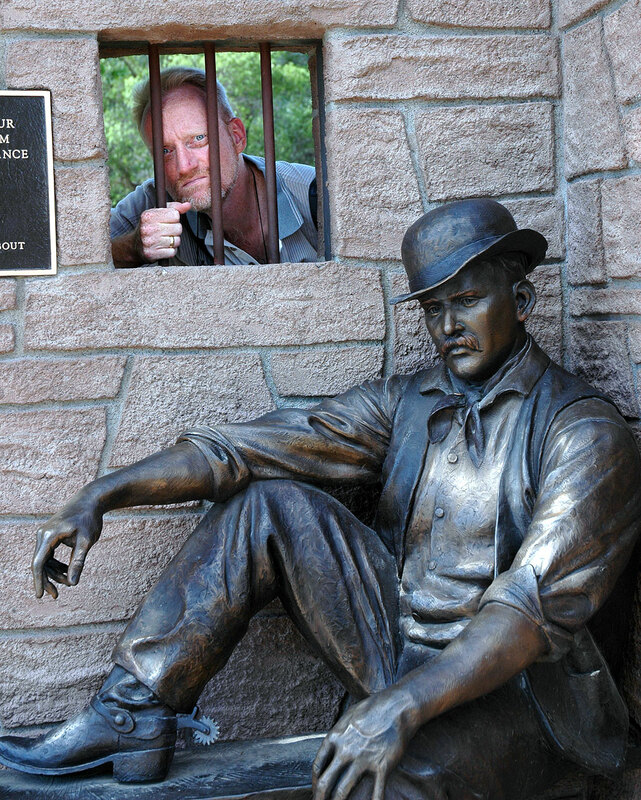 Abby made this image of me at the bronze statue of The Sundance Kid. 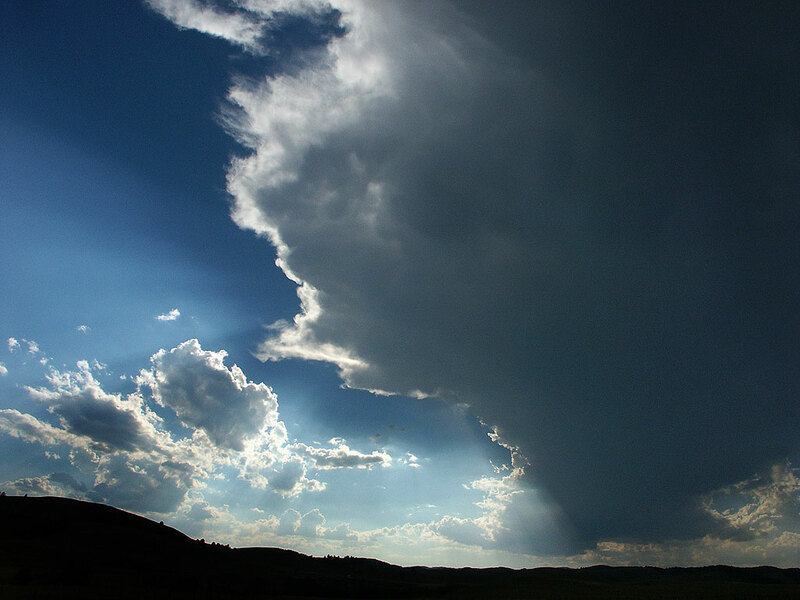 We made a brief stop at Sturgis to honor Abby’s motorcycle riding history, but rain was rolling in, and we didn’t stop to see much. 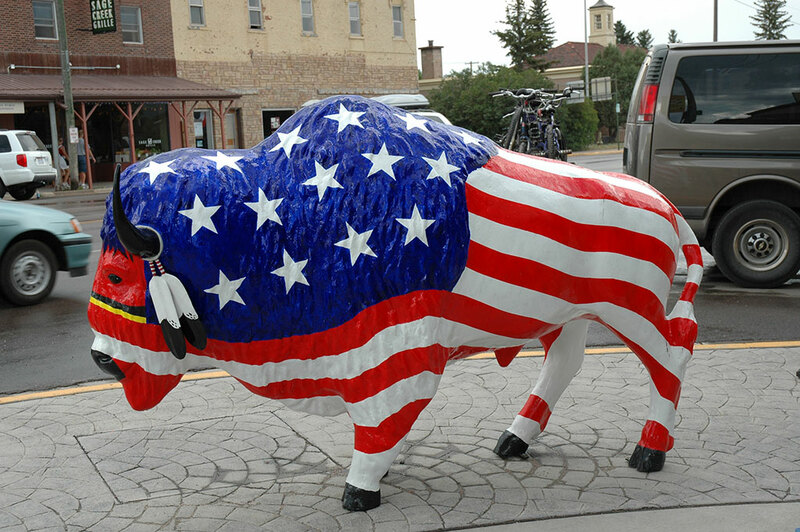 Abby shot this U.S. flag buffalo in Sturgis, South Dakota just before rain rolled in. 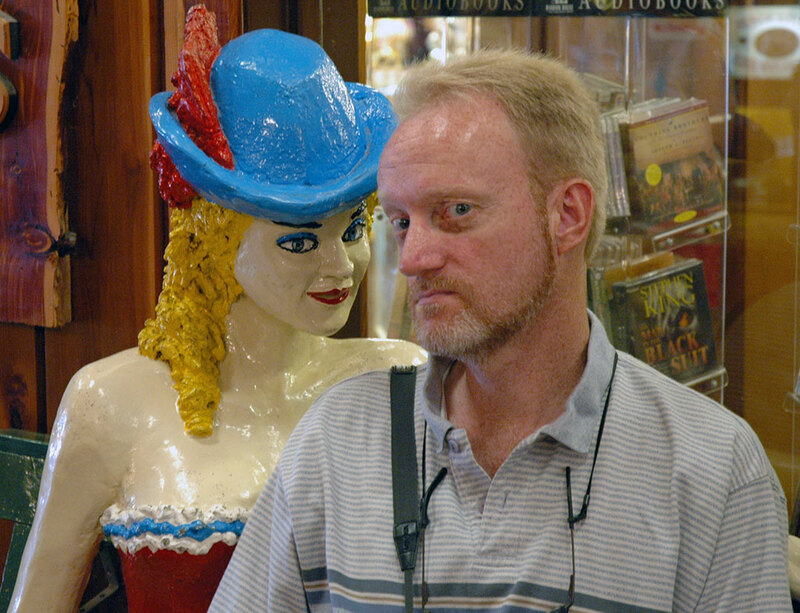 The author poses with a life-size statue of a burlesque performer at Wall Drug. 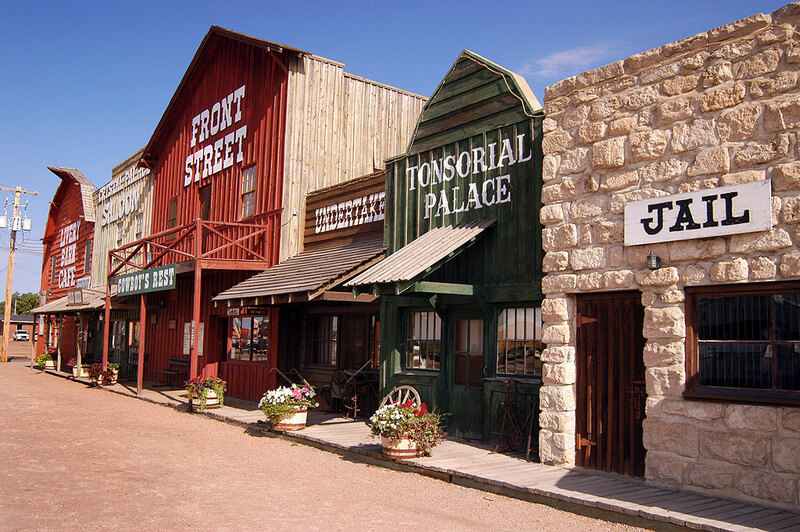 We started the day at a tourist attaction called Wall Drug. It was garish, crowded and enormous, but we both had fun. 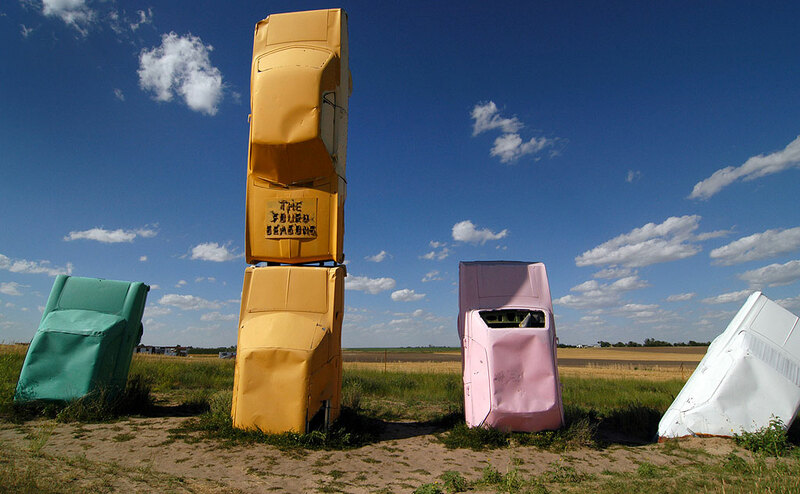 Wall Drug made its reputation by promising “free ice water” on billboards for miles and miles of highway in every direction, and those billboards remain. 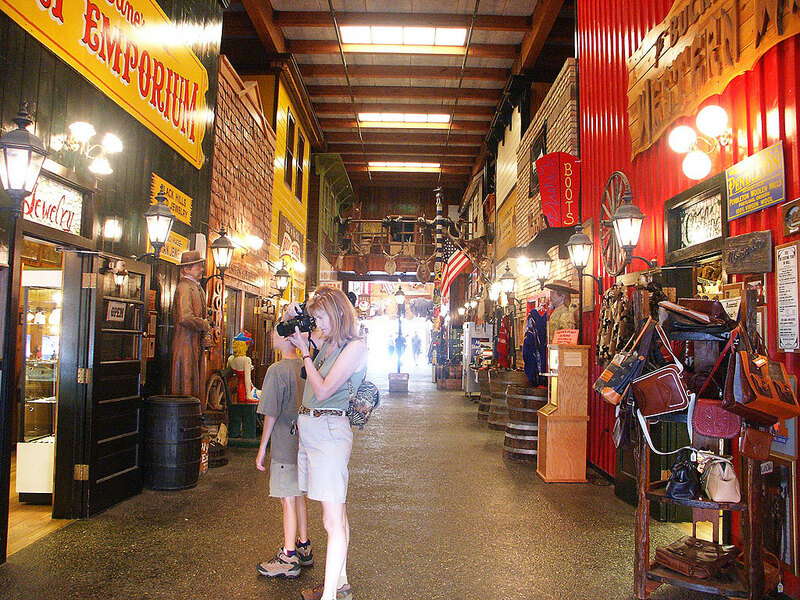 Abby photographs Wall Drug in South Dakota. 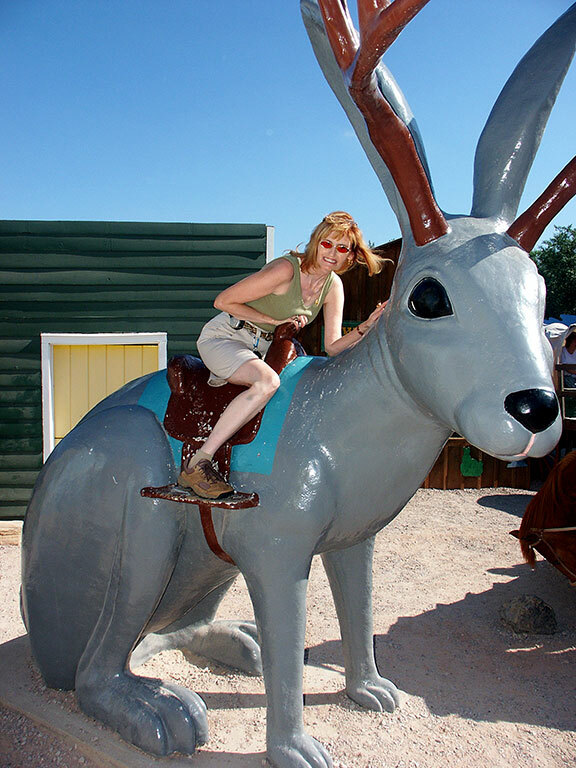 Abby rides the giant Jackalope at Wall Drug. 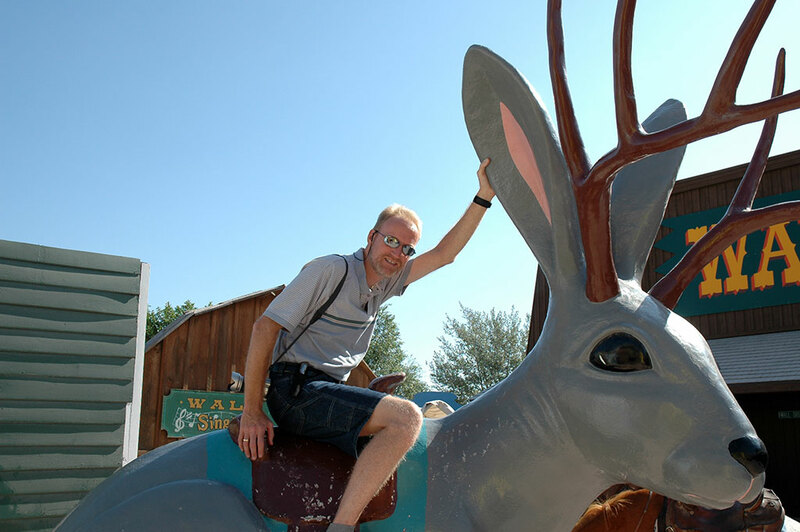 Abby and I traded places and I took a turn on the Jackalope. 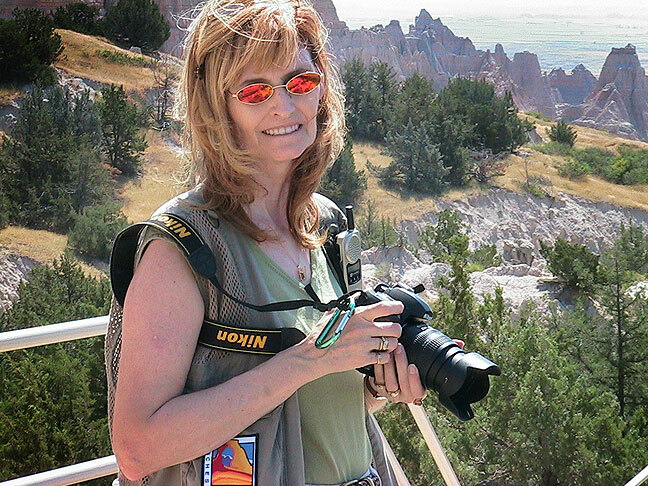 Abby smiles as we hike around at Badlands National Park. 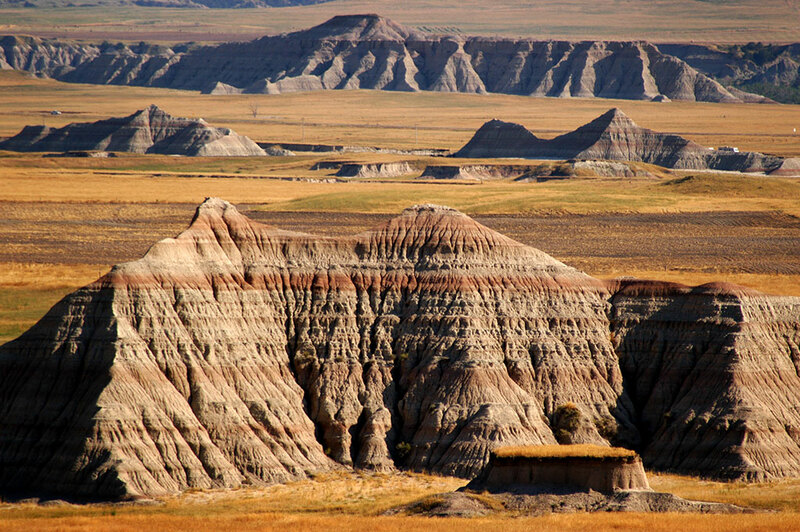 We arrived at Badlands National Park at 10 am, and while we saw the whole thing as fascinating, the light was harsh and bland, and the scenery itself was redundant. 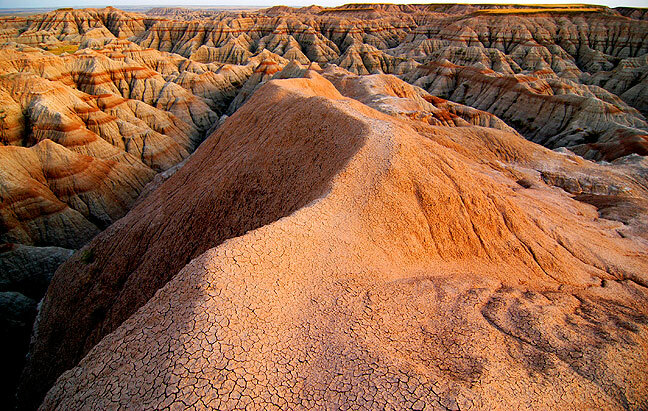 The Badlands are epic in scope, but not as interesting as, say, the Bisti Wilderness or Angel Peak. 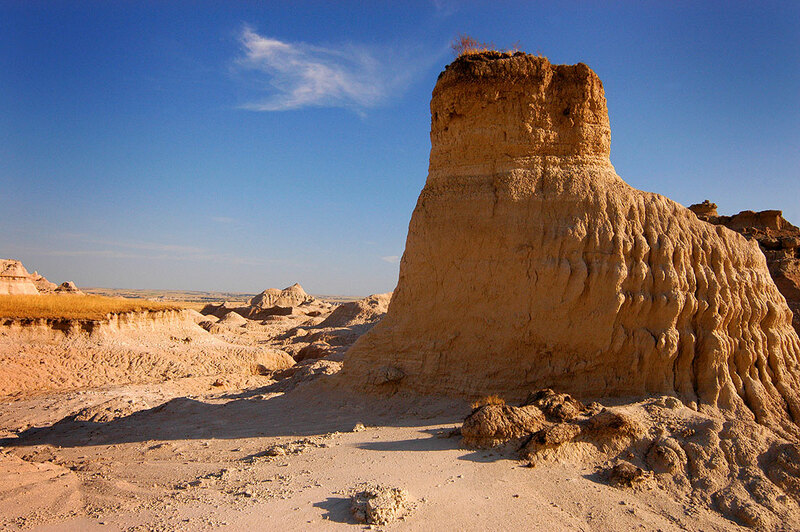 We hiked the door trail, and while the heat wasn’t bad, the whitish formations and brilliant sunlight made it one of the brightest attractions I have ever visited. 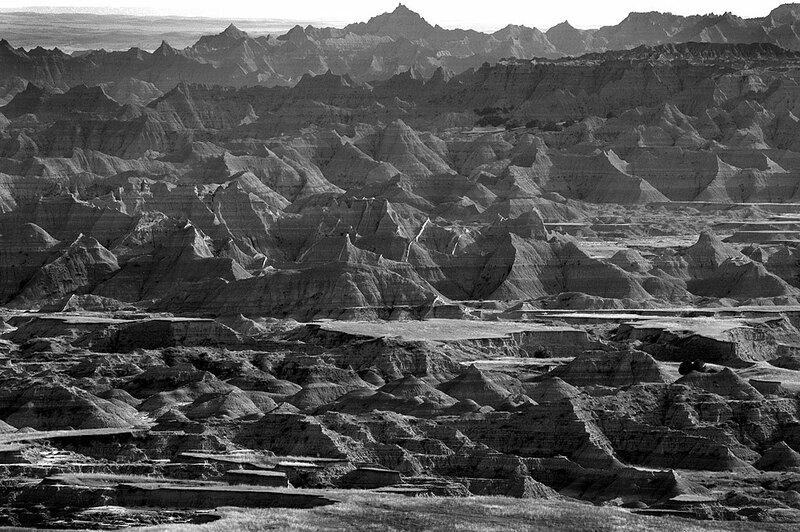 During the middle park of the day, the formations of Badlands National Park have little color, so I shot them in black and white. 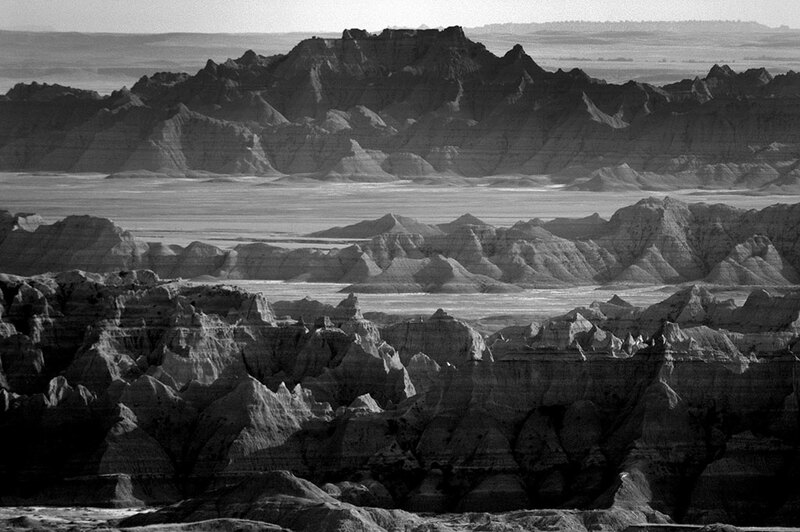 This telephoto view of Badlands National Park shows the depth of the erosions from which the park gets its name. 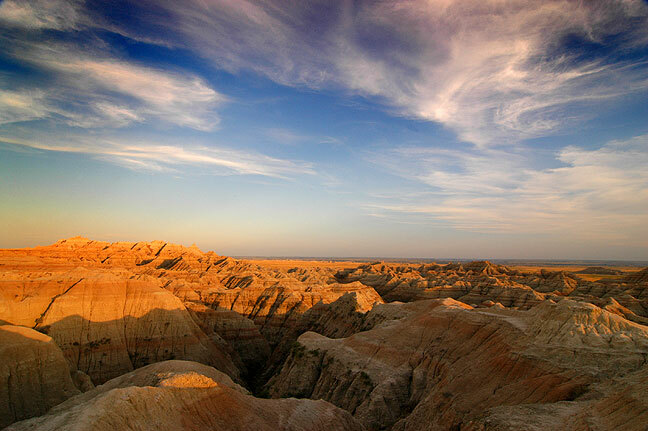 Sunshine and cloud shadows create this dramatic scene at Badlands National Park. 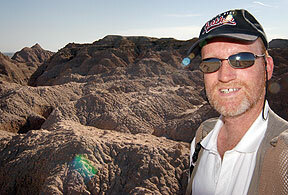 The author smiles for his wife’s camera at Badlands National Park. 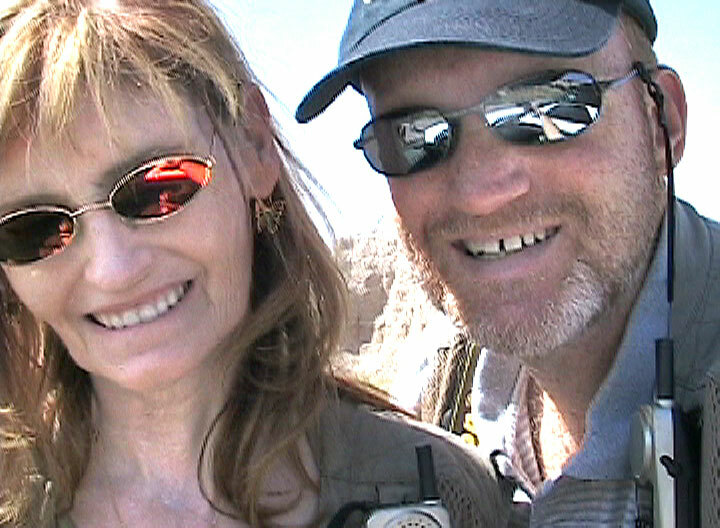 Abby and Richard smile for a self portrait at Badlands National Park. 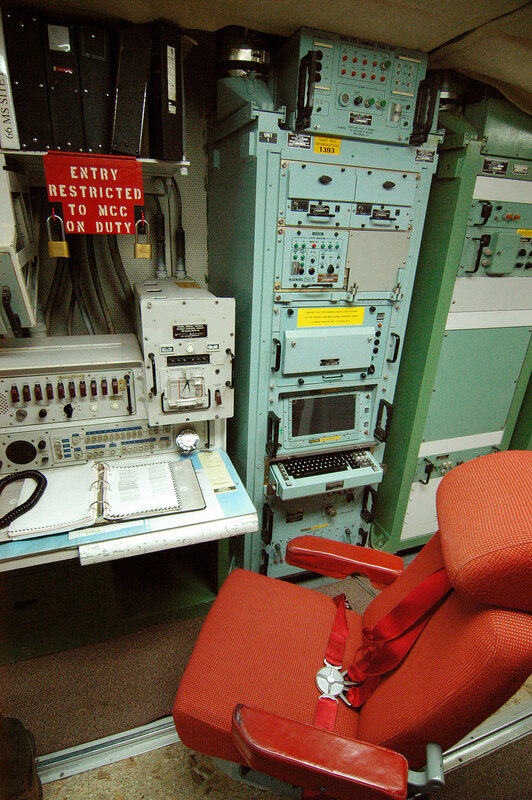 By far the most interesting thing about the day was the tour of the Minuteman Missile National Historical Site. 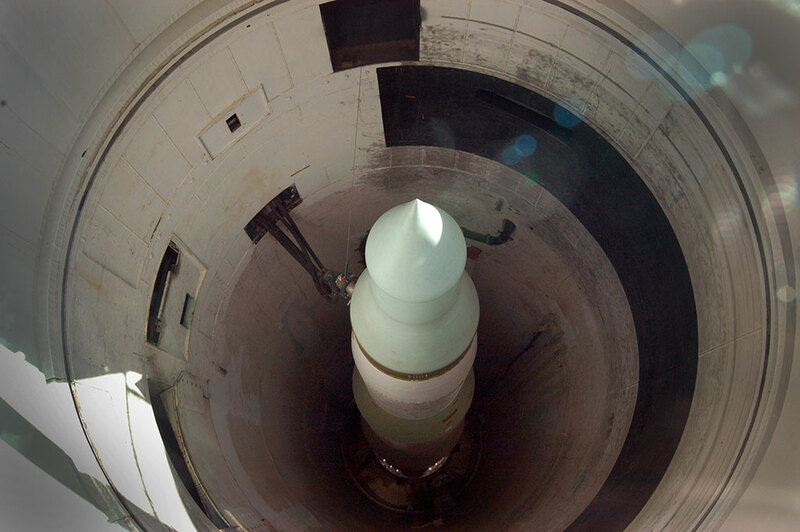 It included the tour of a launch facility, as well as a drive out into the middle of nowehere to see an actual missile in its silo. The first thing visitors see in the launch control facility is this 30-ton steel door and its darkly amusing message. 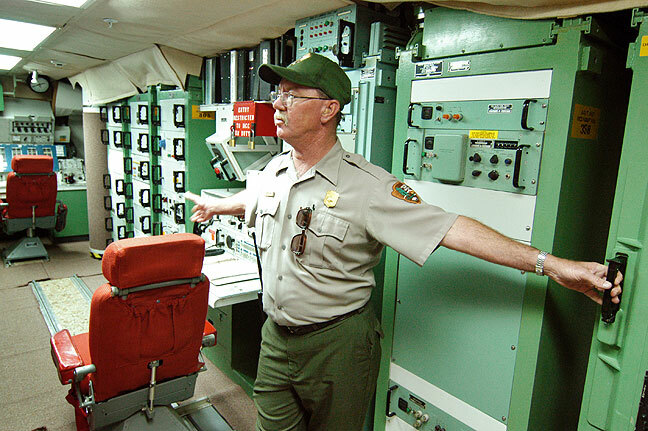 A ranger gives a tour of a launch control room at Minuteman Missile Silo National Historic Site. 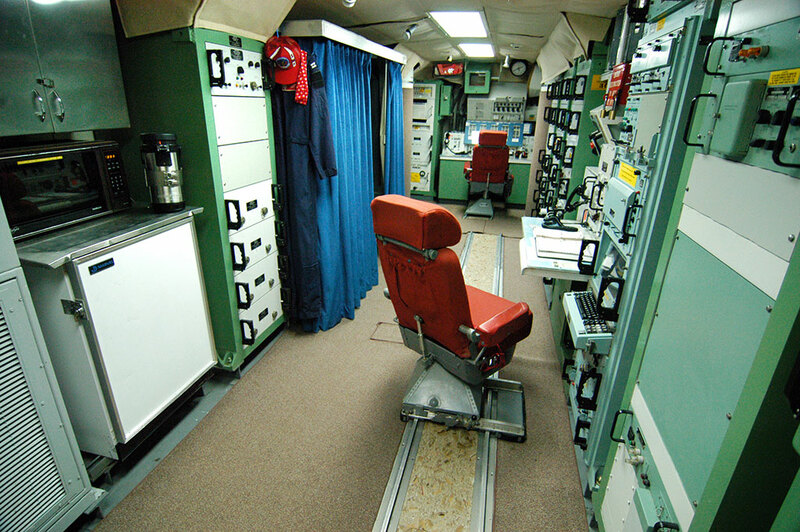 This view of a control station at Minuteman Missile shows the controls panel and the chair, which is bolted to a rail on the floor to help the crew ride out an attack. 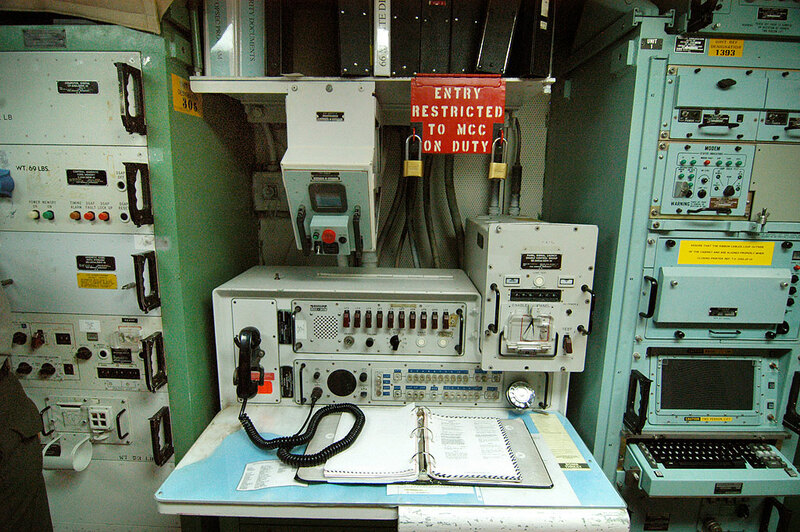 This overview shows the Launch Control Unit at Minuteman Missile National Historical Site. 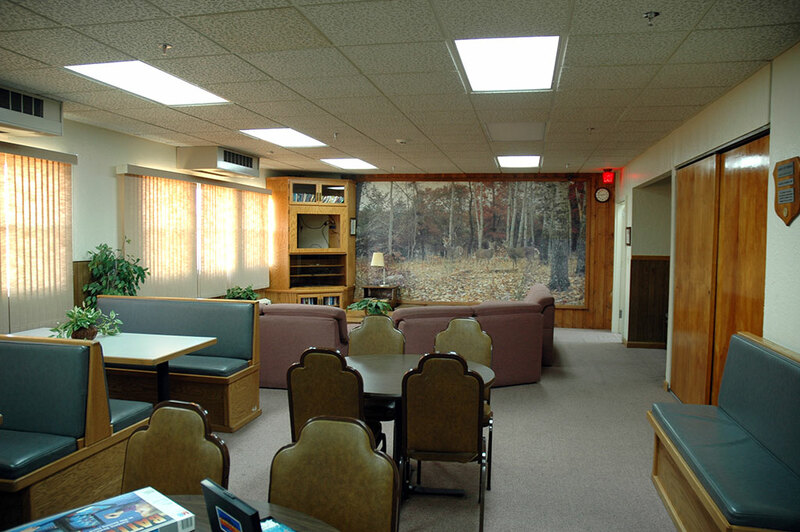 The above-ground residence area of the Minuteman Missile National Historic Site is a very straightforward office/living room. 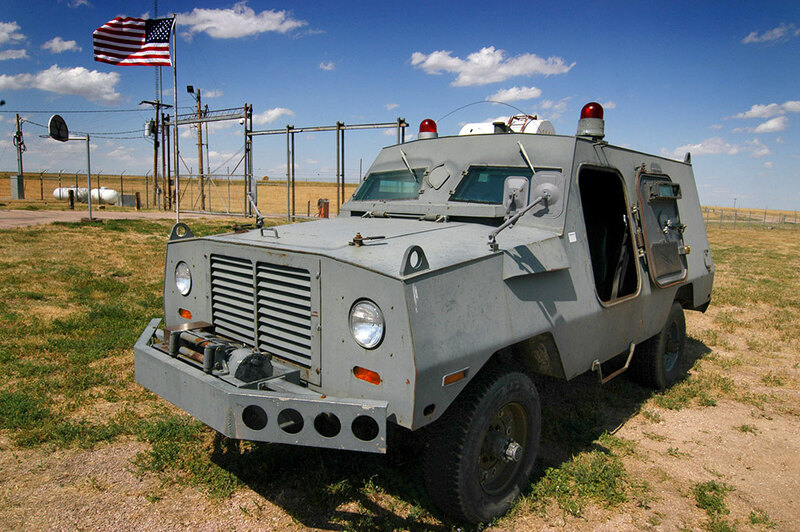 On display outside the launch control facility is this armored car, which rangers told us was despised by Air Force personnel for being under powered, crowded, and rough-riding. Also outside the launch facility is this antenna. I am an antenna guy, but I have no idea how this one works. 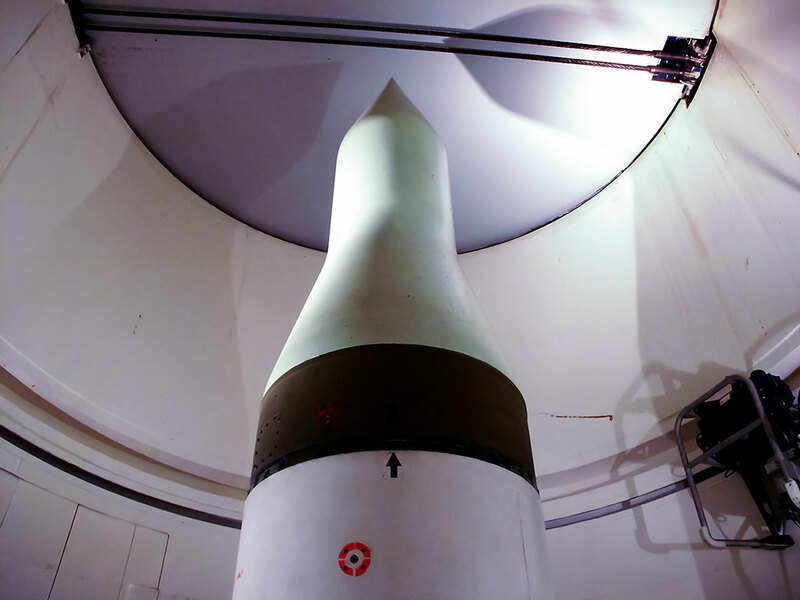 A Minuteman missile sits in its silo at Minuteman Missile National Historic Site. 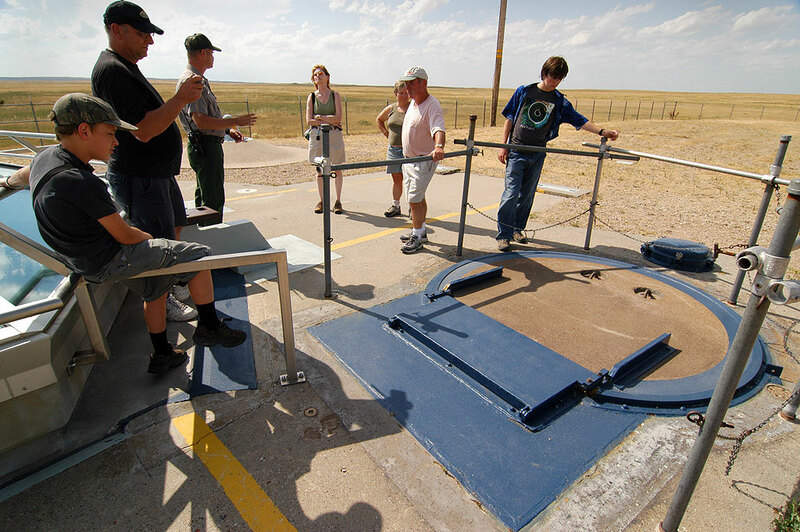 Along with other visitors, Abby listens to a park ranger talk about the Minuteman Missile. 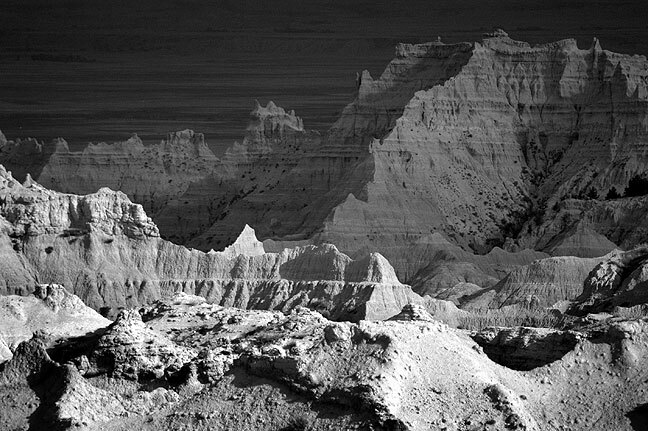 By late afternoon we drove the length of Badlands, making a few nice images, particularly at sunset. 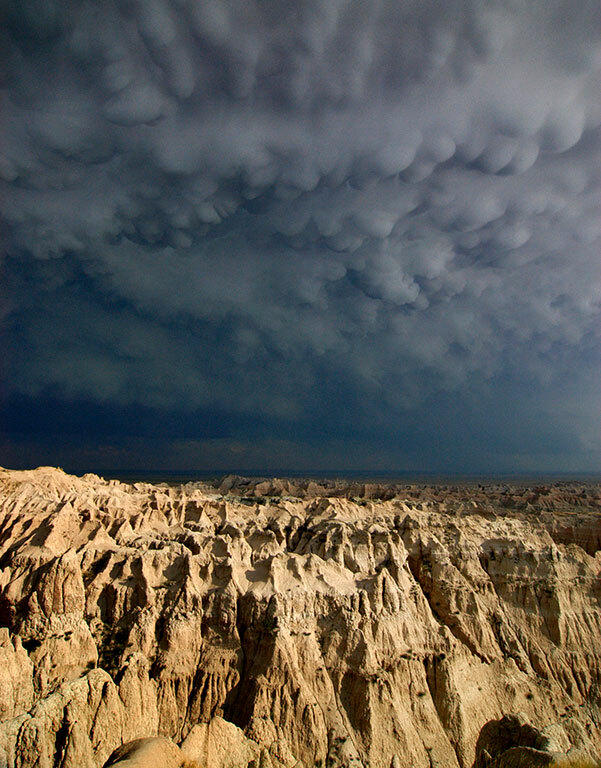 A thunderstorm billows over Badlands National Park. 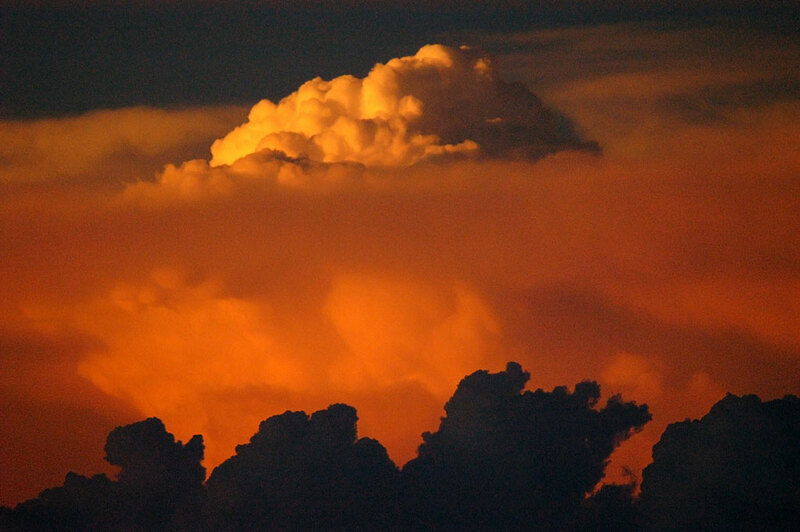 One of the strongest series of images I made on this trip was of this thunderstorm and the detailed mammatus clouds it produced. 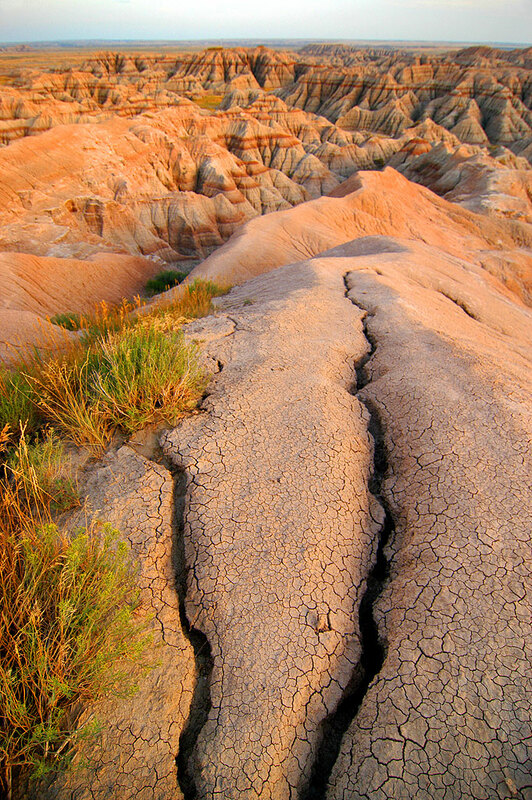 Maturing afternoon light shines on the formation of Badlands National Park. 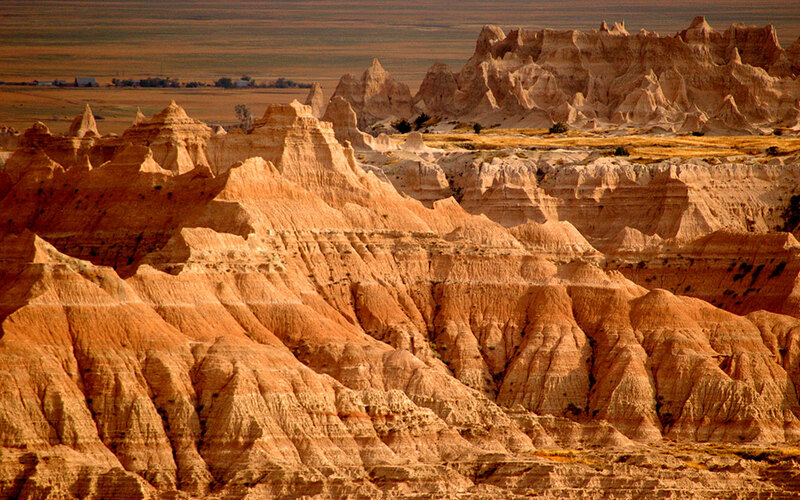 The formations of Badlands take on more color as sunset approaches. 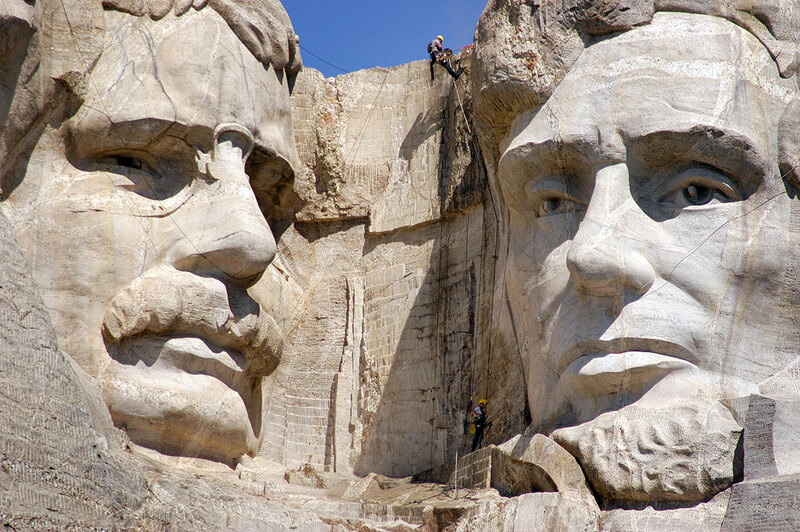 We made two visits to Mount Rushmore, the first in the morning. 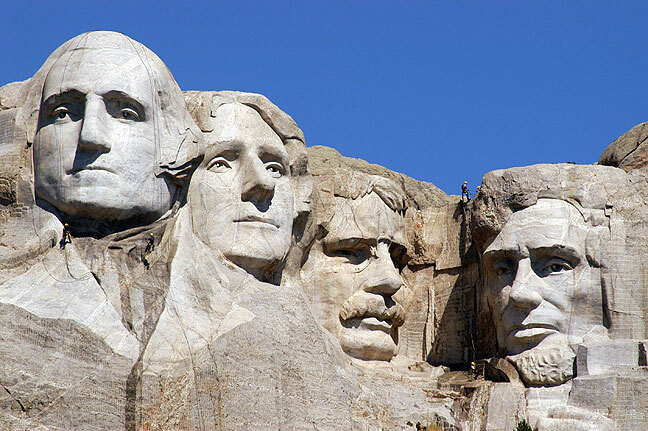 They were powerwashing the mountain. 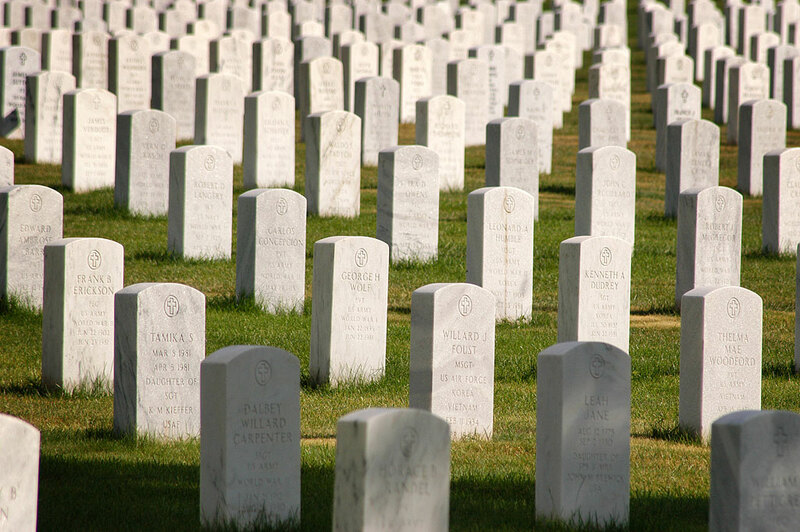 It was amazingly crowded. 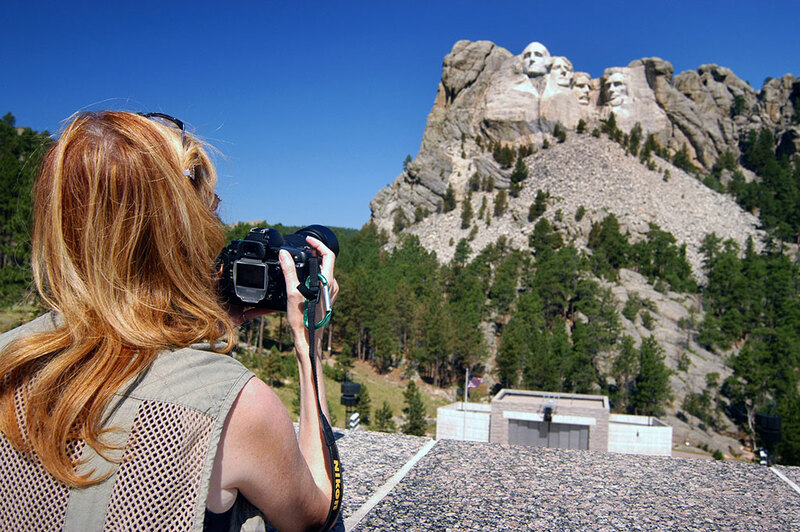 Abby photographs Mount Rushmore National Monument. 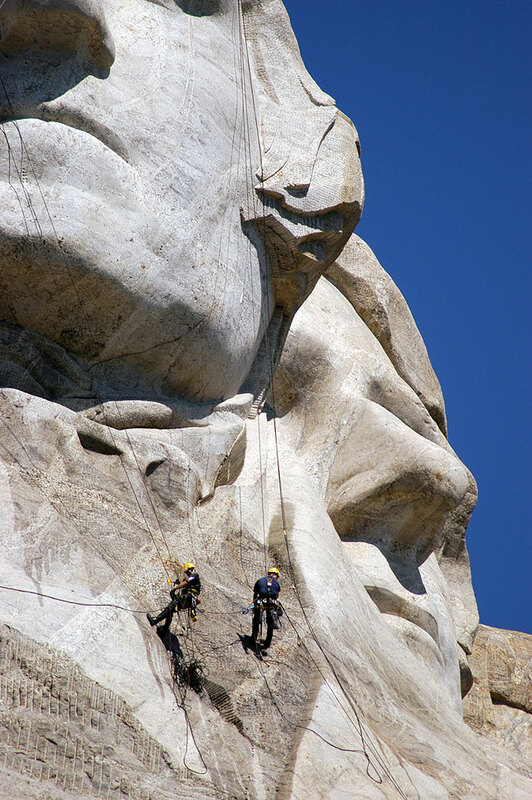 Workers dangle on the faces of Mount Rushmore as they power wash the attraction. Promenade, Mount Rushmore National Monument; as you can see, this was one of the most crowded attractions we have ever visited. 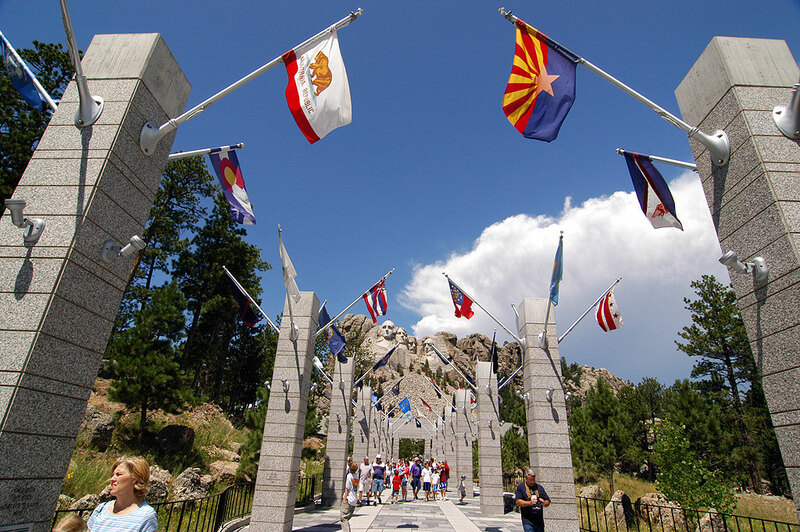 The flags of all 50 U. S. States, including ours, Oklahoma, are displayed at Mount Rushmore. 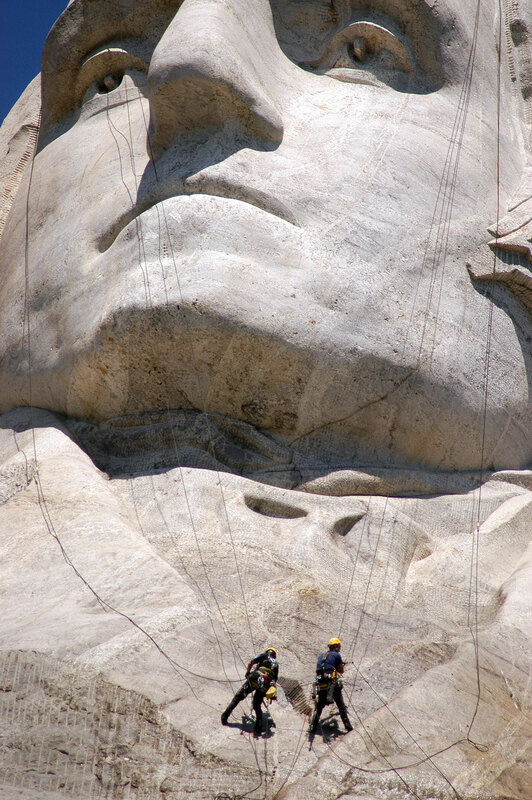 Workers rappelling on lines with power washing equipment are visible in this Mount Rushmore image. 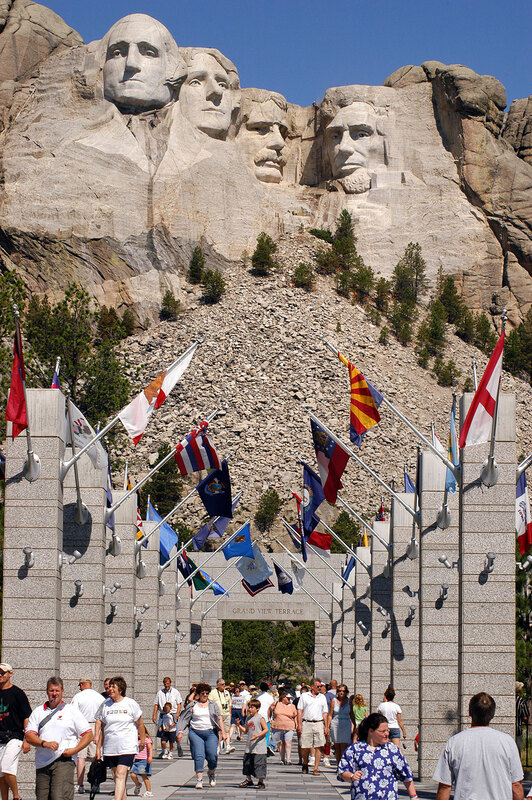 Between visits we saw the Crazy Horse Memorial, and oddity that seems to have turned into a huge tourist affair. 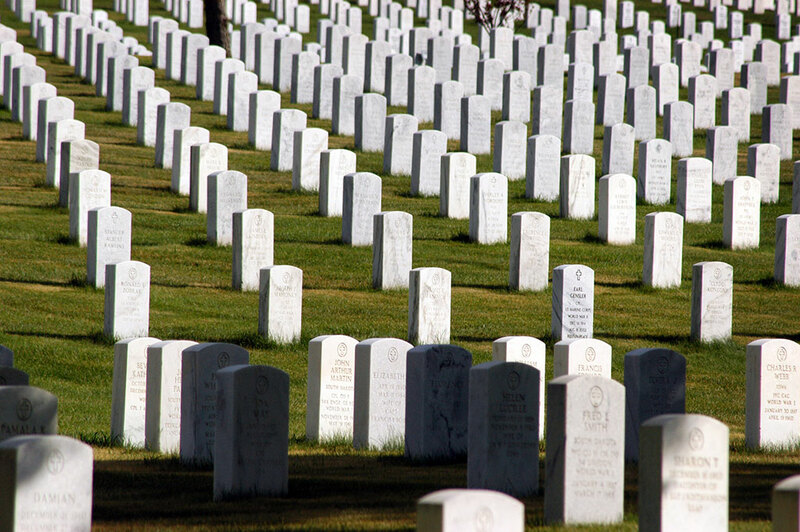 The monument itself is on a 100-year completion timetable. 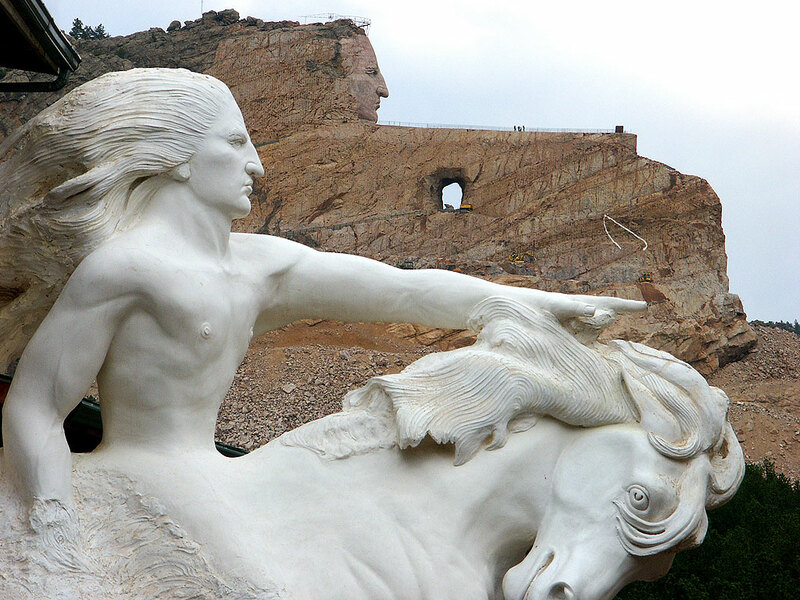 We photographed Crazy Horse Memorial in the afternoon. 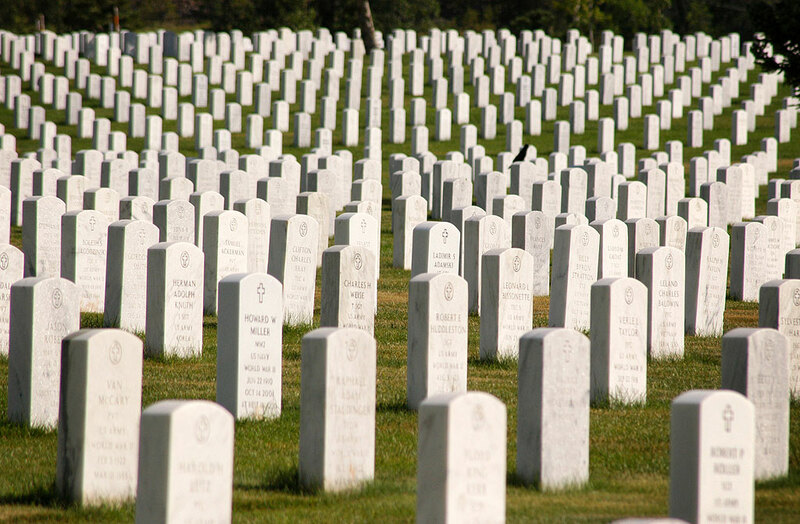 In addition to the memorial, it was my impression that the entire complex had been turned into a pricy tourist attraction. 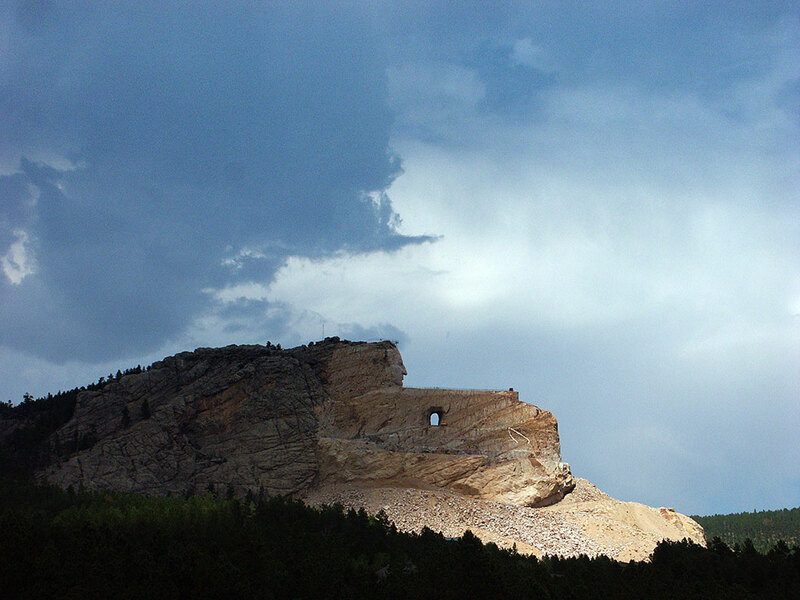 This broad view of the Crazy Horse Memorial shows its enormity beneath a thunderstorm. 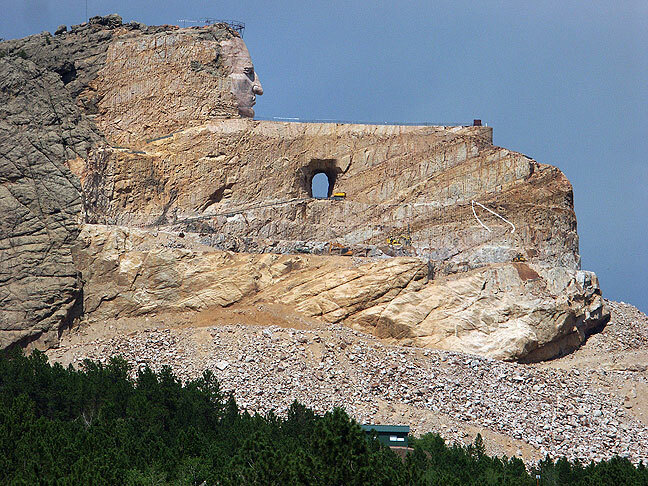 This view of the Crazy Horse Memorial shows how the mountain sculpture is supposed to eventually look. 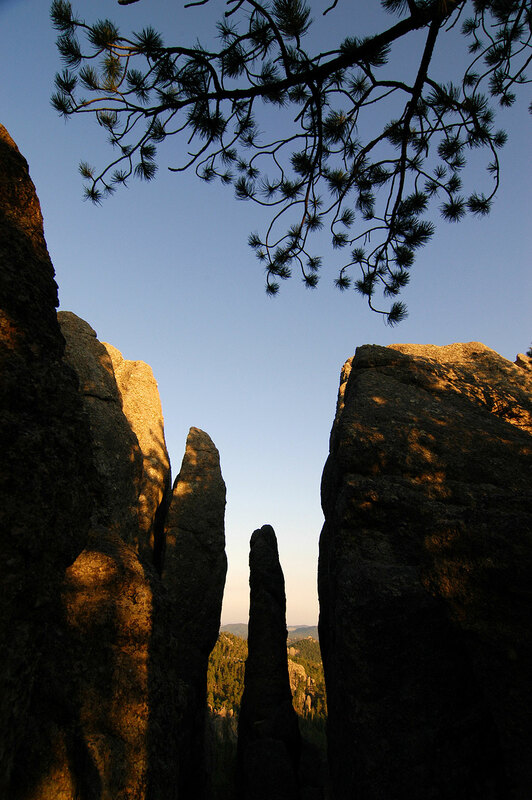 Also, we had an excellent drive through Custer State Park. 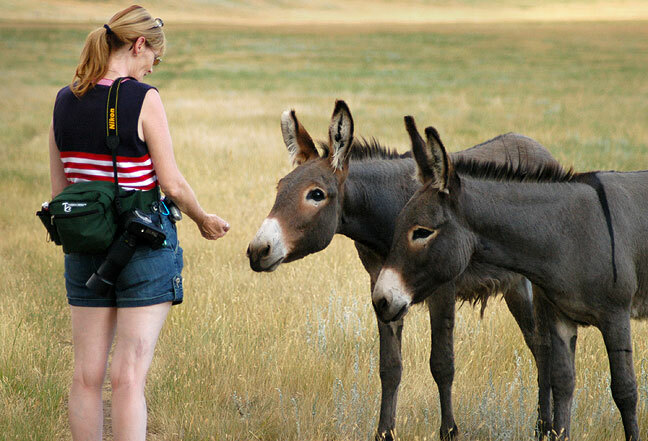 A Custer State Park employee told us about some wild donkeys in the park, and Abby was able to coax them close enough for them to eat out of her hand. 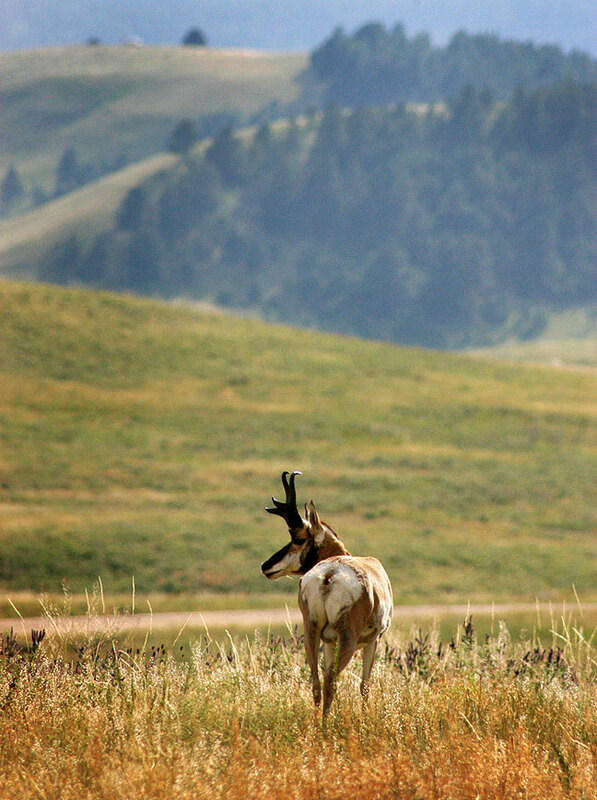 Custer State Park, South Dakota, is noted for its wildlife, like this pronghorn. 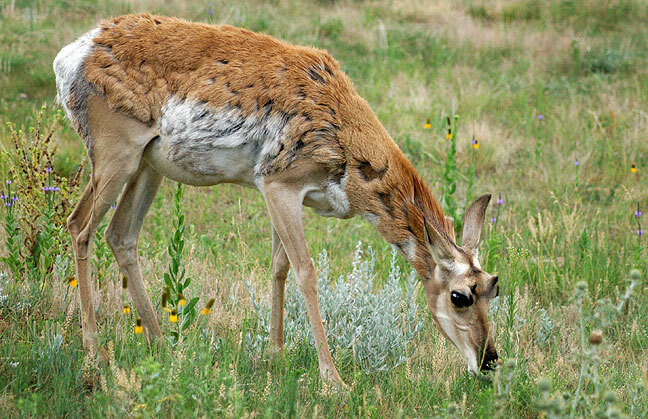 Also in Custer State Park, we spotted this young deer. 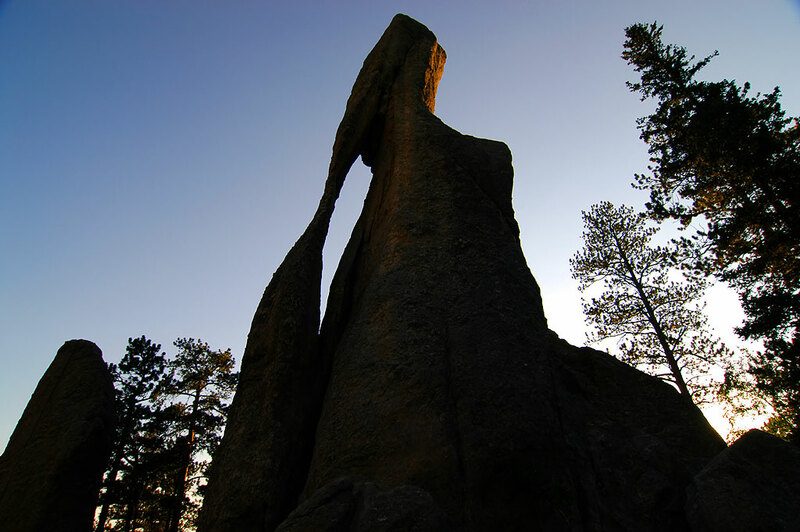 The spindle-like spires give the Needles Highway its name. 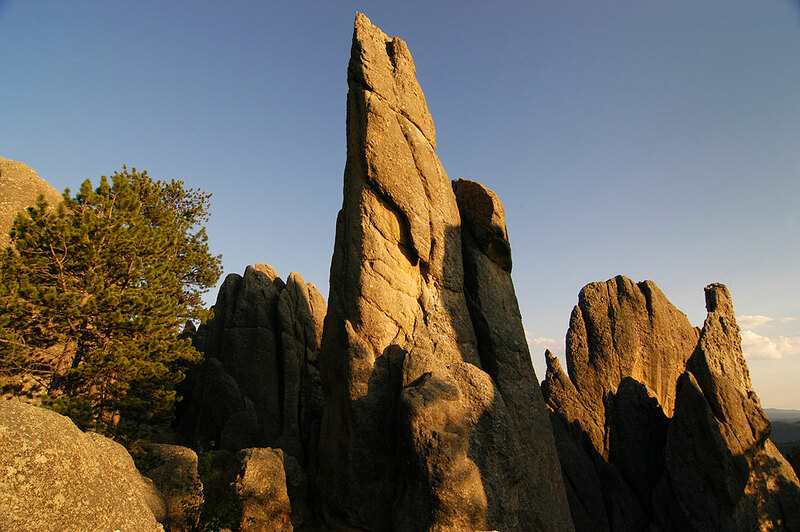 Spires and a tree limb come together for this strong composition in the Needles at Custer State Park. 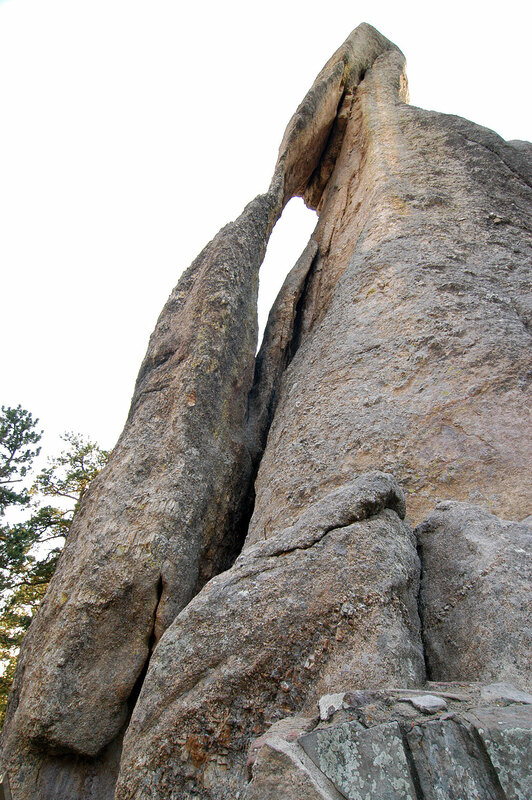 The Eye of the Needle on the Needles Highway, is a signature formation at Custer State Park. 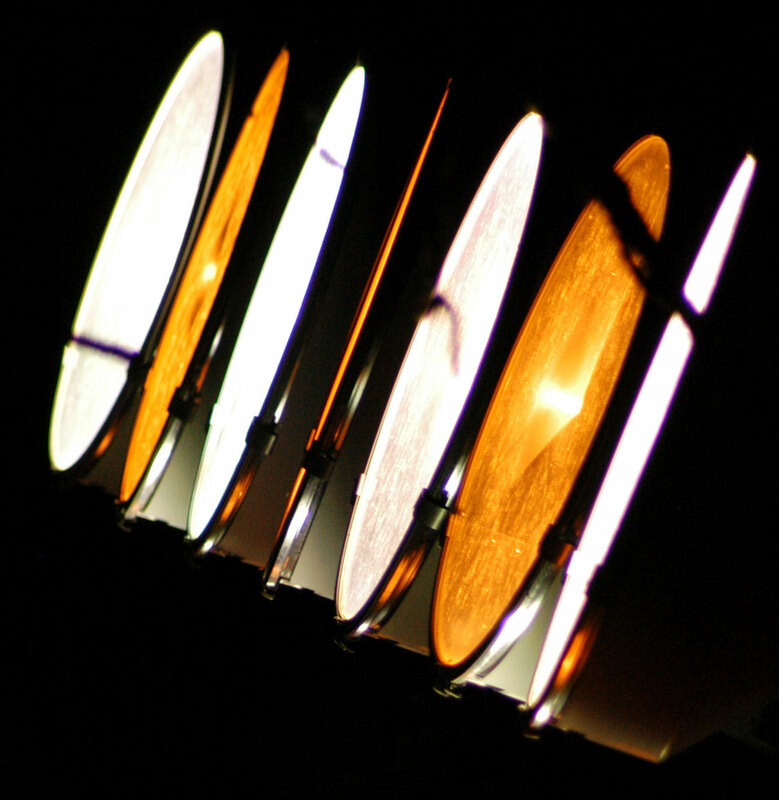 This image of The Eye of the Needle was made in the same place at the time time as the previous image, but with a completely different exposure. 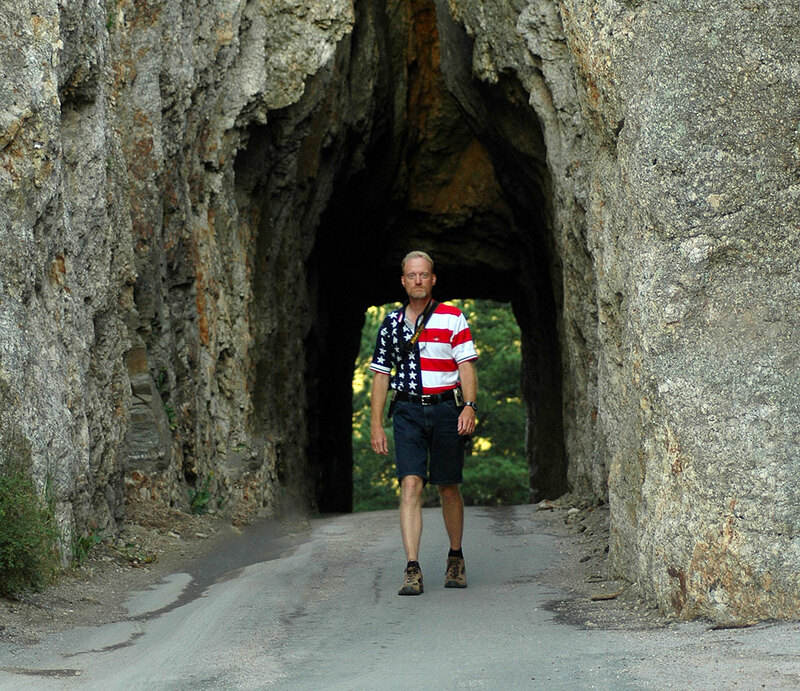 The author walks through “The Keyhole,” a tunnel on the Needles Highway in Custer State Park, South Dakota. 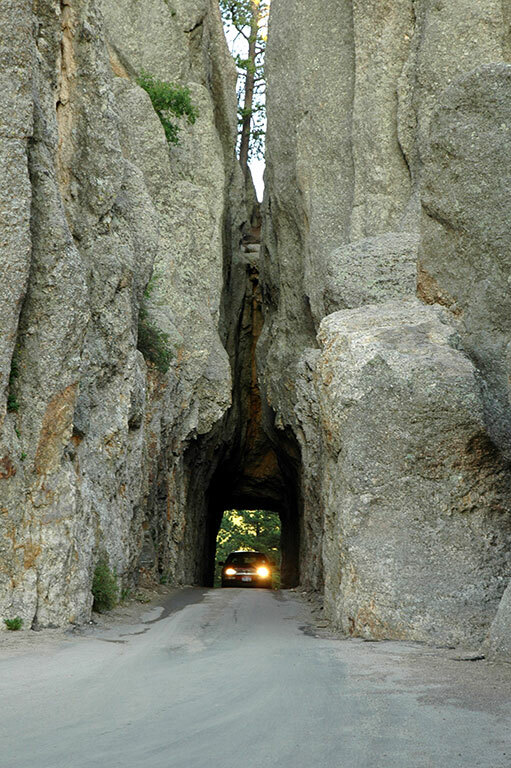 Abby photographed this car coming through The Keyhole on the Needles Highway. 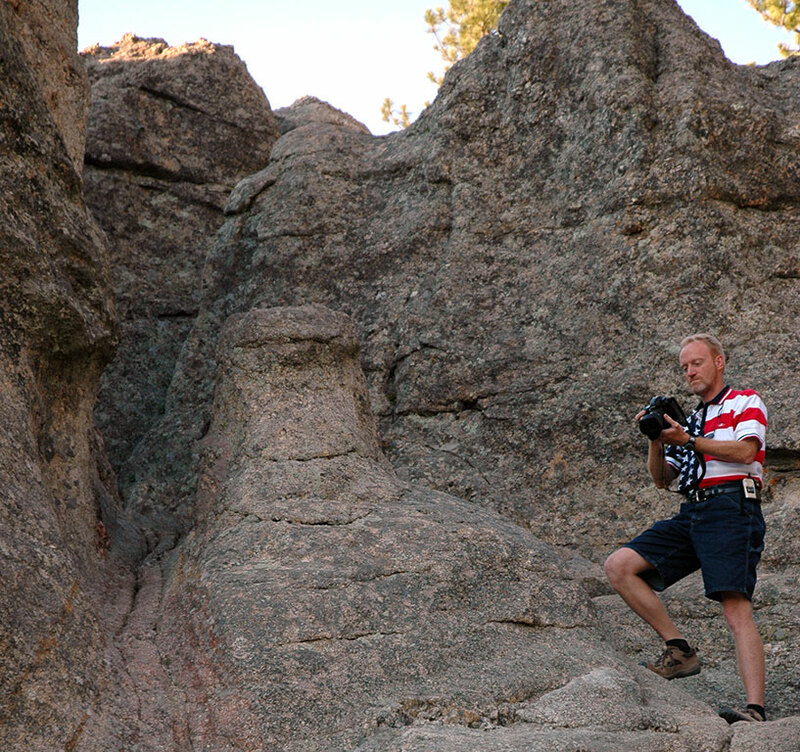 Near The Keyhole, I prowled the surrounding cliffs to photograph the Needles Highway at dusk. 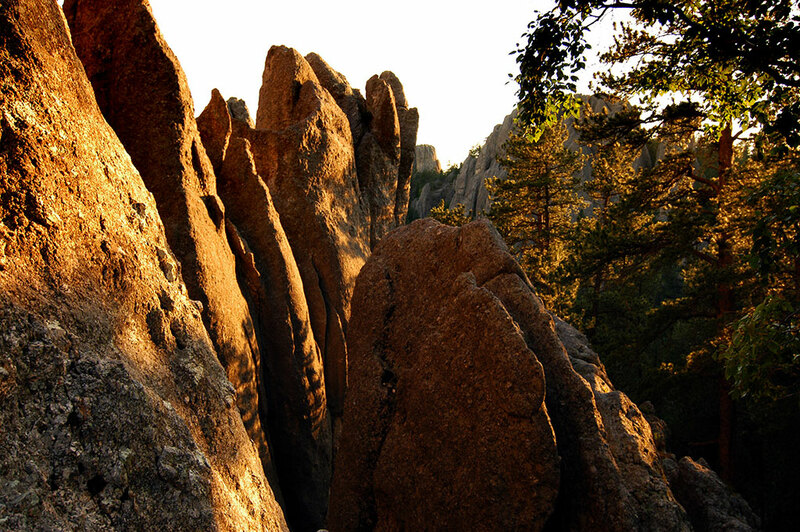 Colors deepen as dusk approaches on the Needles Highway in Custer State Park. 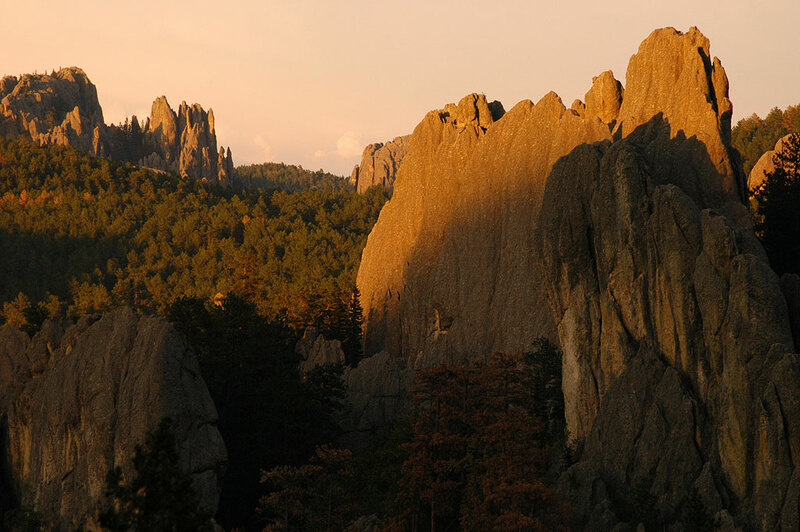 The shadows of sunset creep up on distant formations of the Needles Highway at Custer State Park. 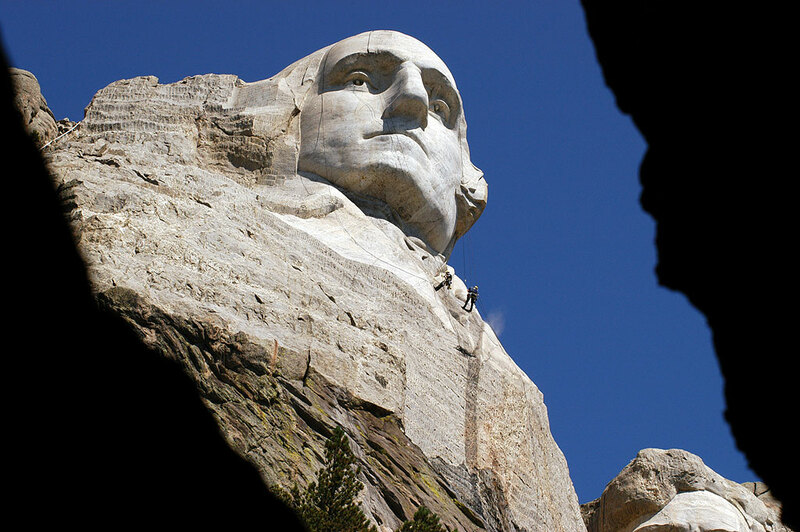 By nightfall, we had returned to Mount Rushmore for the lighting ceremony. 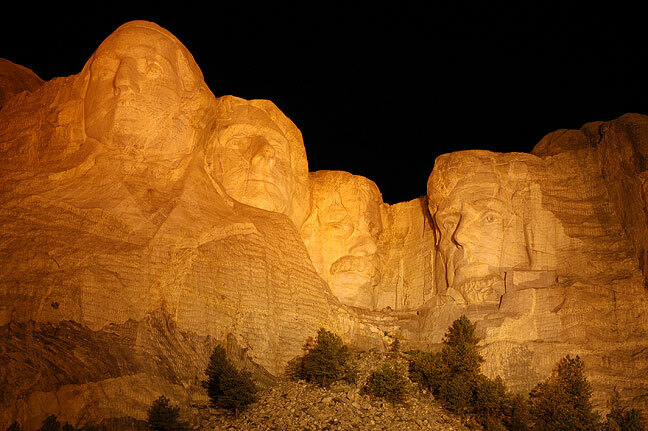 Huge amber and white lights shine on the face of Mount Rushmore after the evening lighting ceremony. 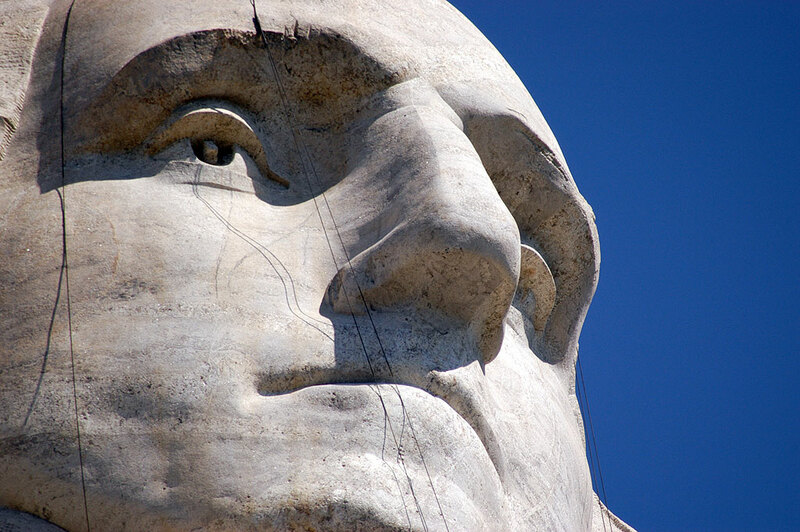 The faces on Mount Rushmore are illuminated by deep amber light during the nighttime ceremony at the Monument. 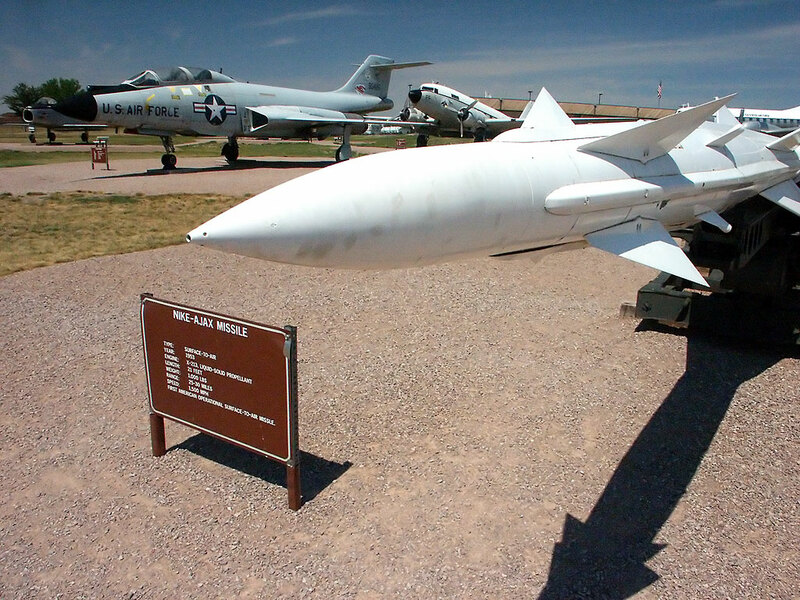 A Nike Ajax missile stands on display at Ellsworth Air Force Base. 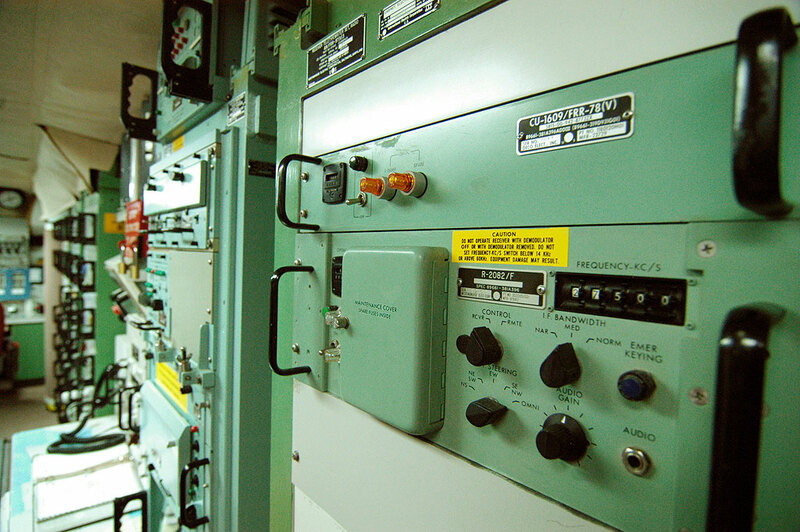 We took a tour of the South Dakota Air and Space Museum at Ellsworth Air Force Base, which allowed us to actually go down inside a decommissioned Minuteman Missile silo. 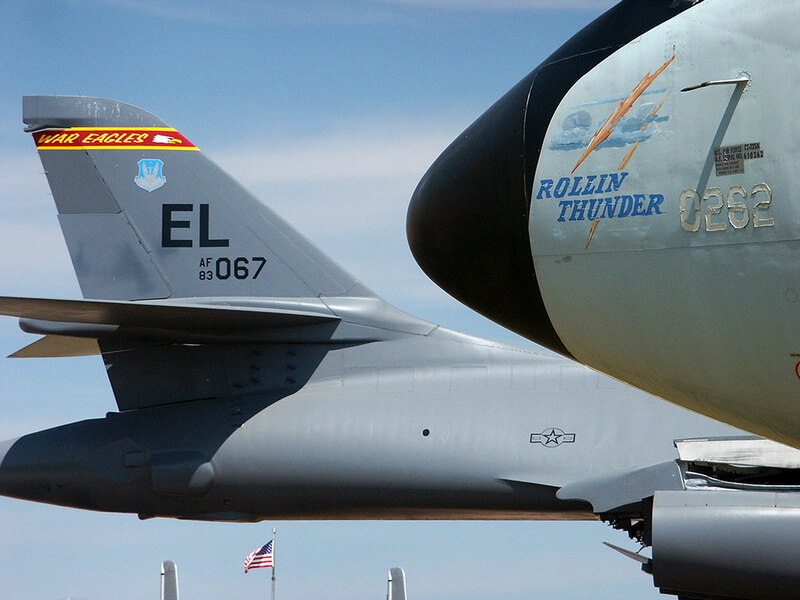 A Rockwell B-1 Lancer stands on display, Ellsworth Air Force Base in Rapid City, South Dakota. 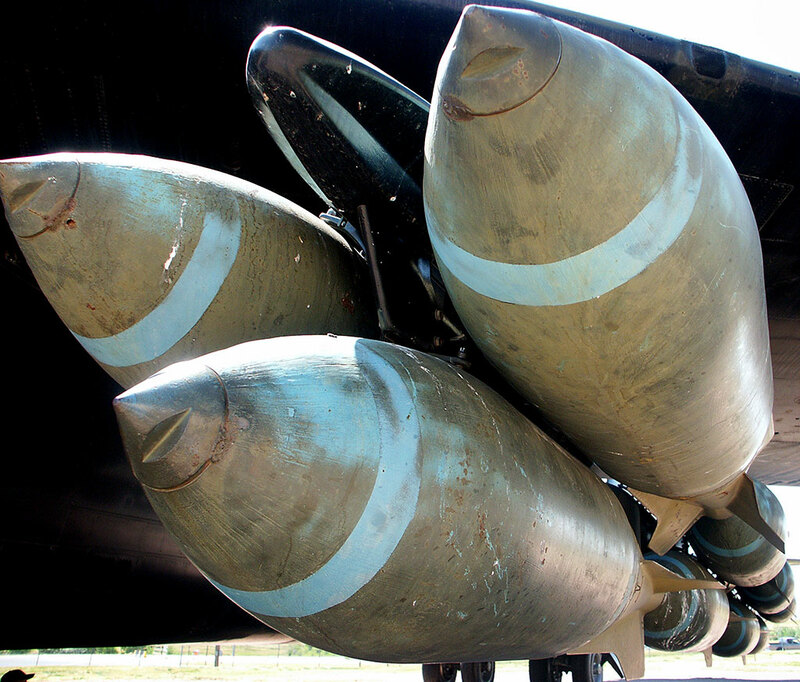 A rack of free fall bombs hangs on the external mount of a Boeing B52 bomber. 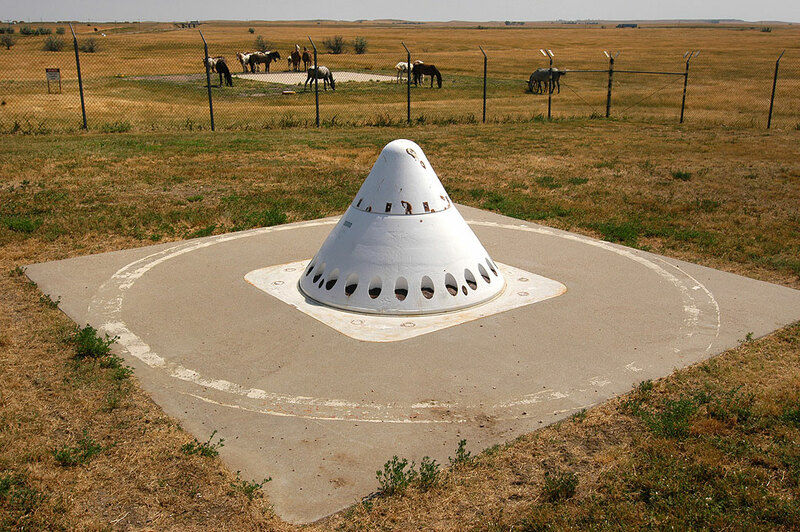 Unlike Minuteman Missile National Historic Site, Ellsworth Air Force Base allows visitors to enter a decommissioned Minuteman training silo and see the launch vehicle up close. 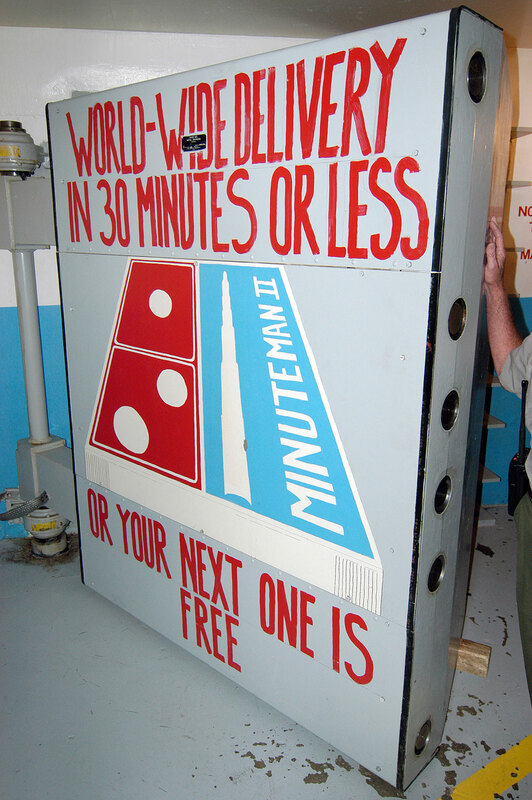 Ellsworth Air Force Base also has this full-size decommissioned Minuteman Missile on display outside. For a weapon capable of visiting immense destruction on its target, this missile is surprisingly small. 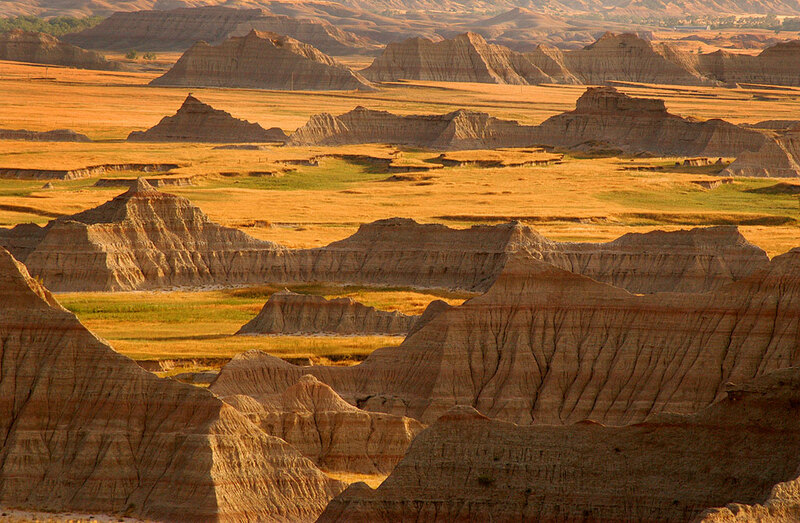 Your host hikes at Badlands National Park. 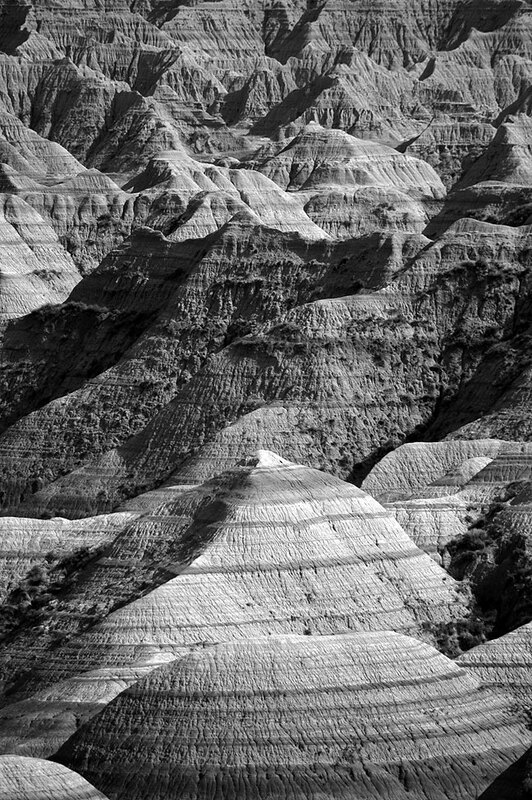 Abby was tired, so I dropped her off at the motel and headed for Badlands, where I had a nice, decently difficult hike and made some really nice images. 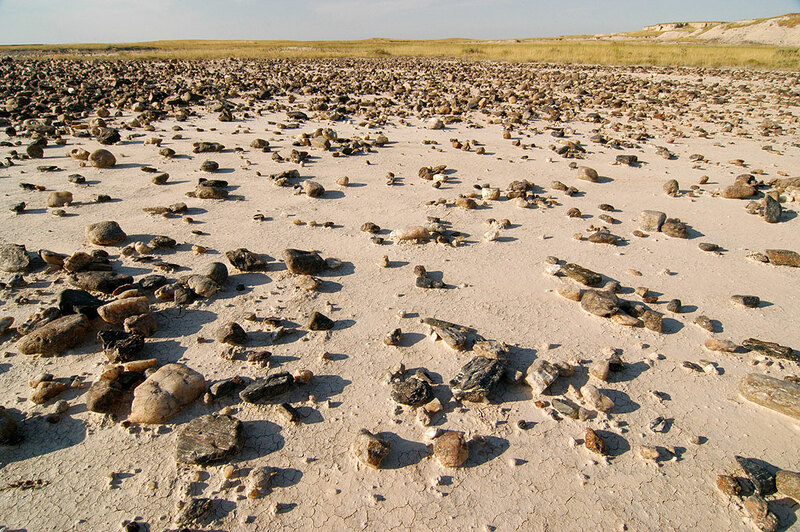 Scattered stones on a playa along the Castle Trail, Badlands. 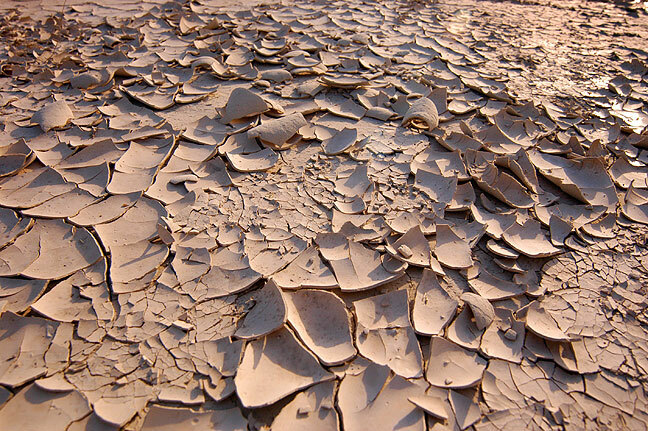 Cracked mud flats like this were common along the Saddle Pass trail at Badlands National Park. 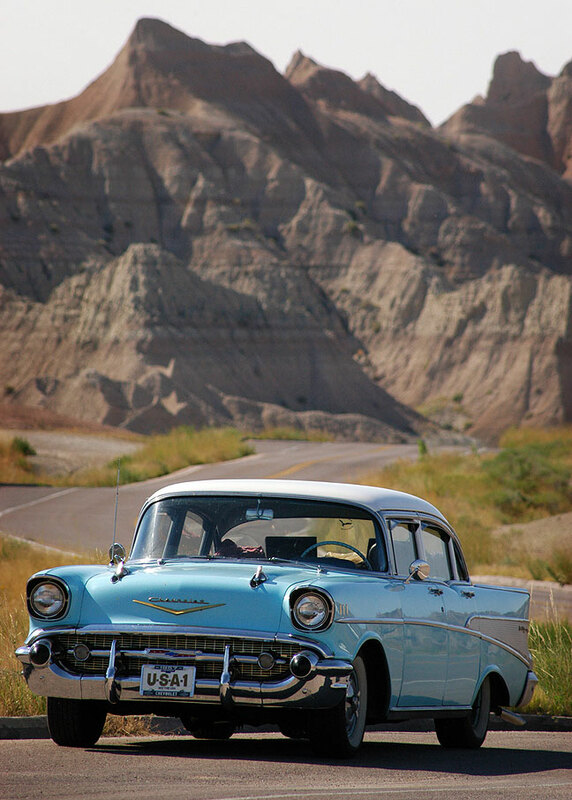 A classic Chevrolet sits by the side of the main road through Badlands National Park. 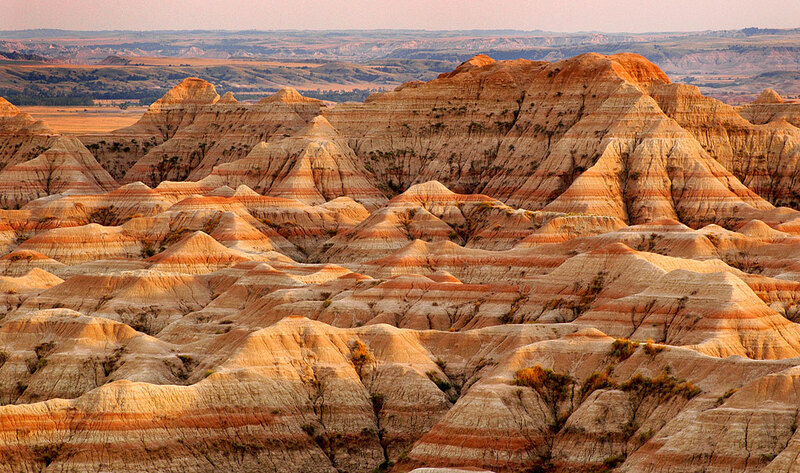 Badlands National Park sunset is seen from the Pinnacles Overlook. 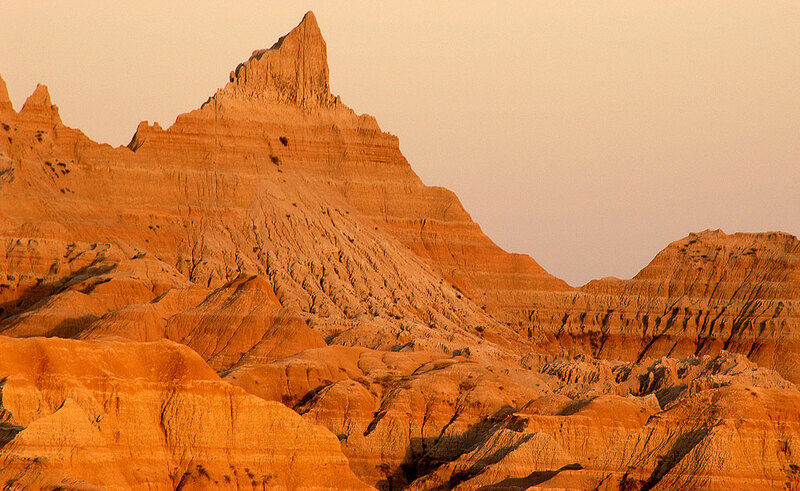 Evening light catches the erosions of Badlands National Park, South Dakota. 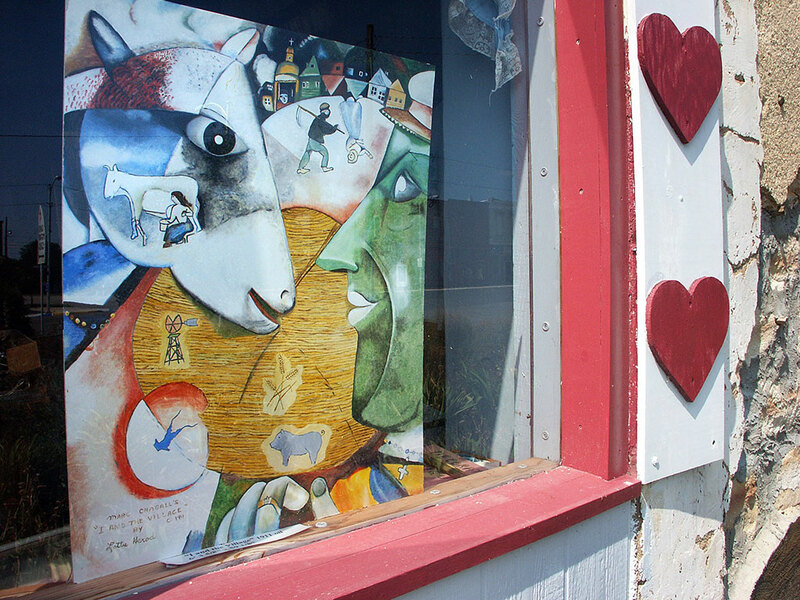 We were able to see the Enchanted World Doll Museum in Mitchell, South Dakota. 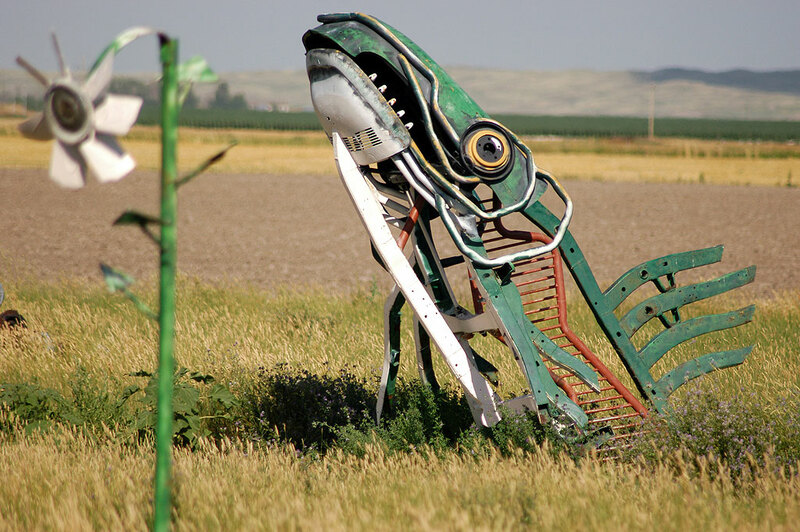 Later we photographed Abby in Abbyville, Kansas. 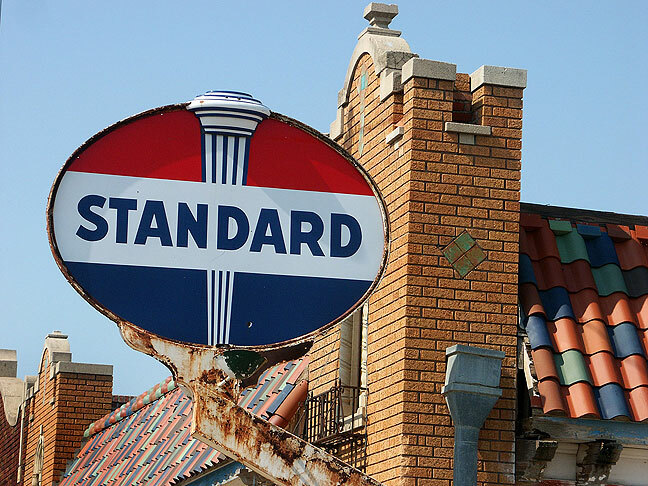 We spotted this handsome Standard Oil sign in Nebraska. 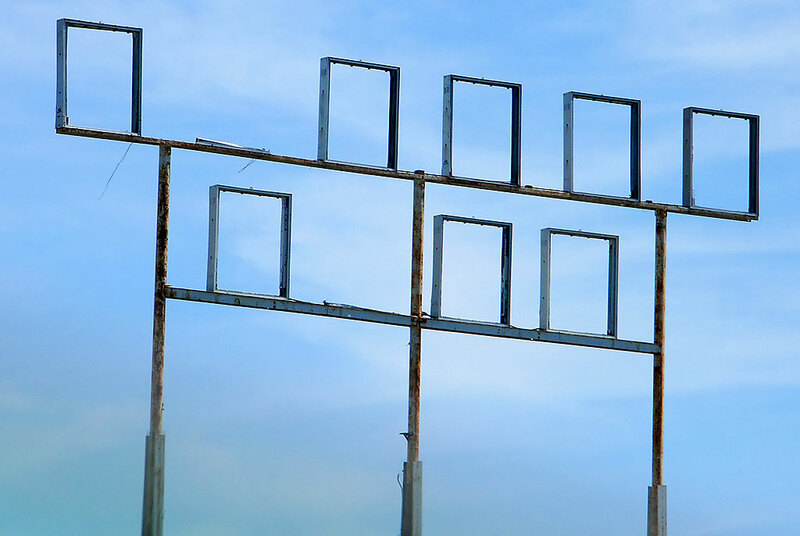 I photographed this empty sign along Interstate 90 in South Dakota. We photographed this railroad crossing, stop sign and abandoned farm somewhere along the road in Nebraska. 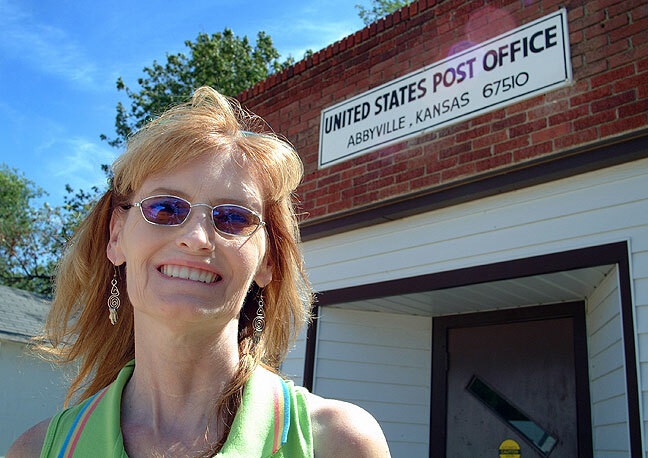 Abby smiles as she poses in Abbyville, Kansas. 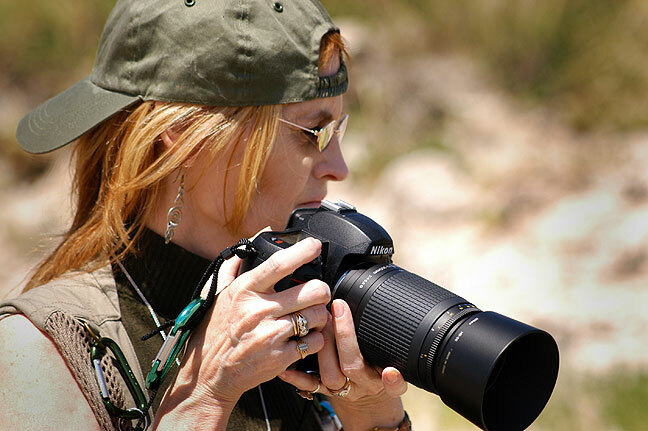 Abby smiles at me as she photographs a chipmunk at Custer State Park.